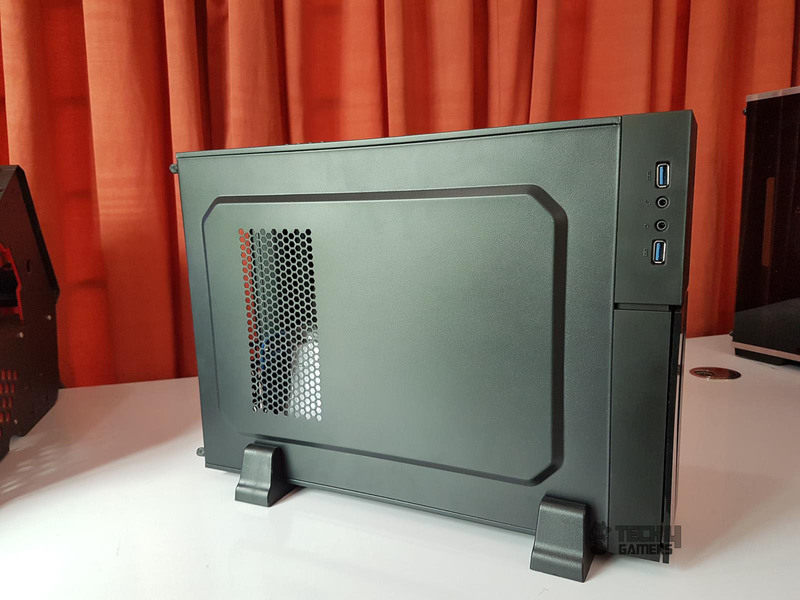 Aerocool has sent use their new budget chassis in the SFF (Small Form Factor) category named as Playa Slim. 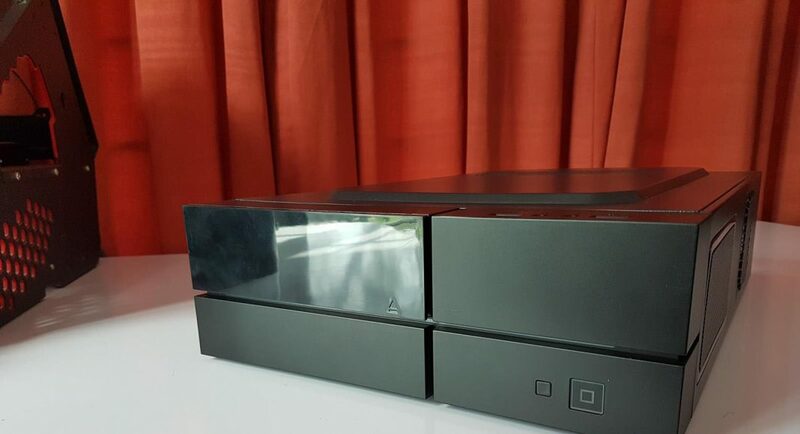 It is basically a re-iteration of their CS101 (PGS-C) chassis with modernized cross design front side which closely resembles that of Play Station from Sony. 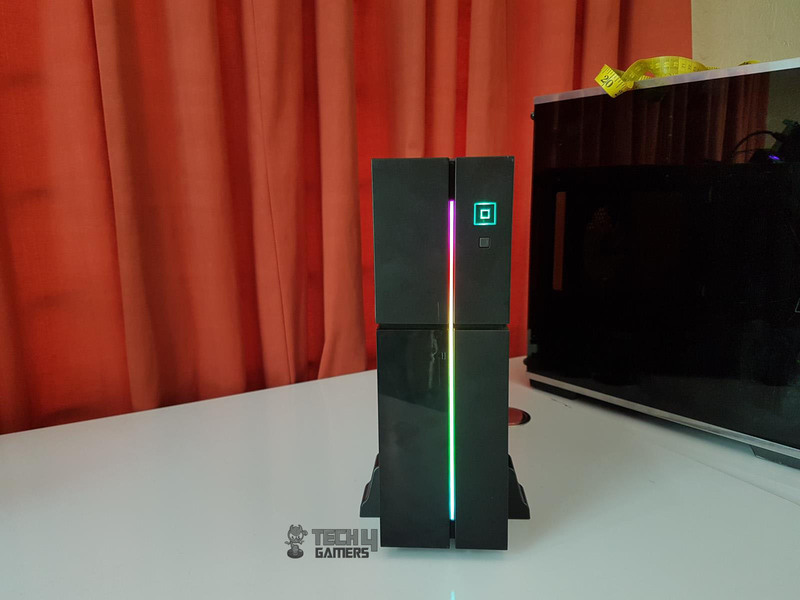 Plus, it features an RGB flow on the front side with 6 RGB lighting modes and 7 static lighting modes. The internal layout is almost identical to that of CS101. 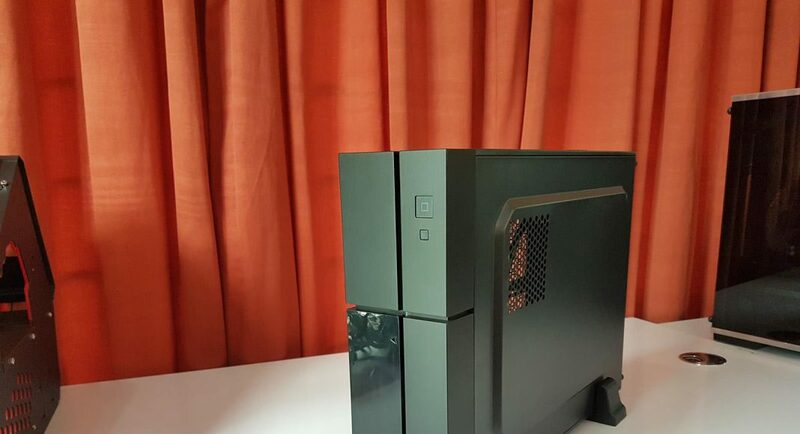 This chassis can accommodate motherboards up to microATX size. 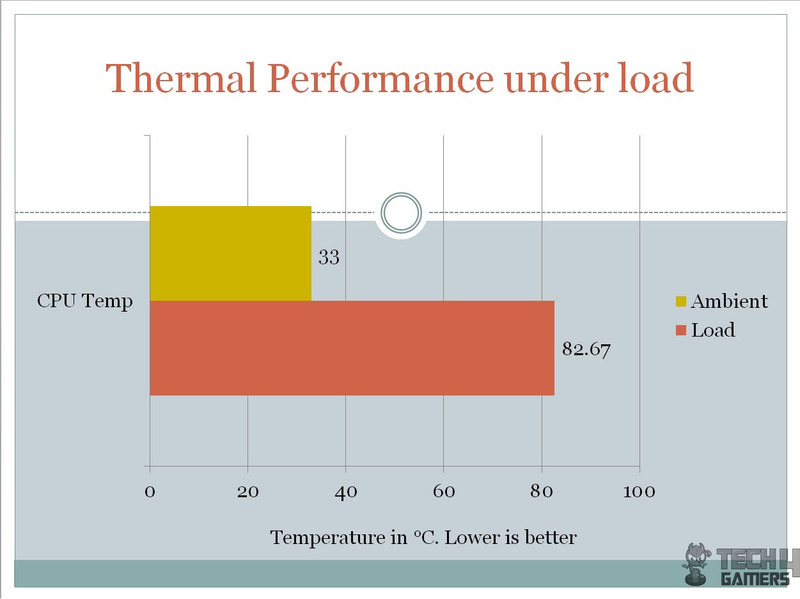 Since, it is an SFF format, only low profile CPU coolers of height up to 80mm can be used. Similarly, only low profile graphics card can be installed with a maximum length of 240mm without ODD. Chassis has a support for a 5.25” drive, a 2.5” SSD, and a 3.5” HDD or combination of SSDs/HDDs. 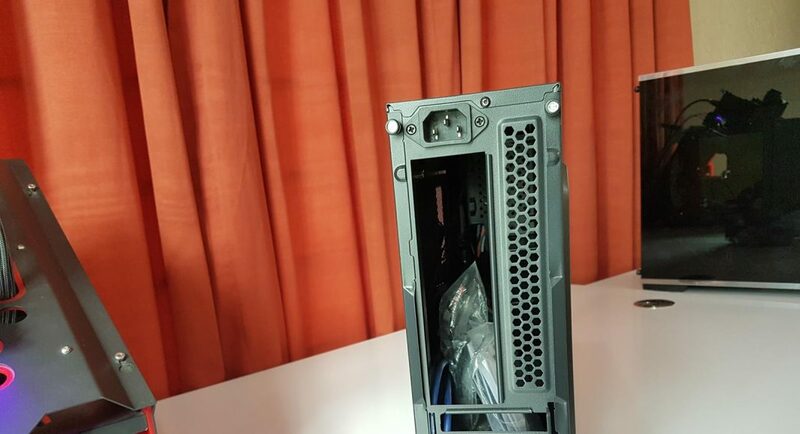 Only SFX format PSU can be installed in this chassis. It is compact, lightweight and is ideal for situations where space is constrained or portability is a requirement. 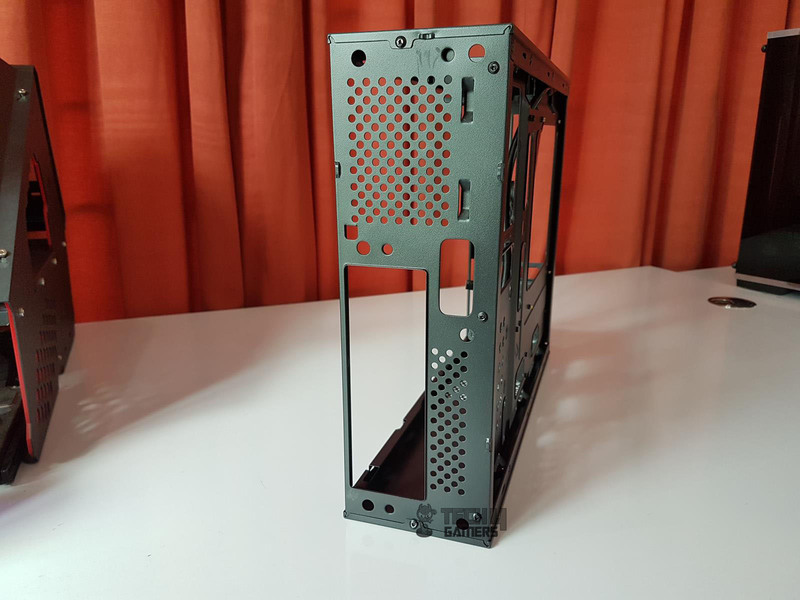 The chassis can be placed on the table in tower format (vertically) or in a desktop format (horizontally). 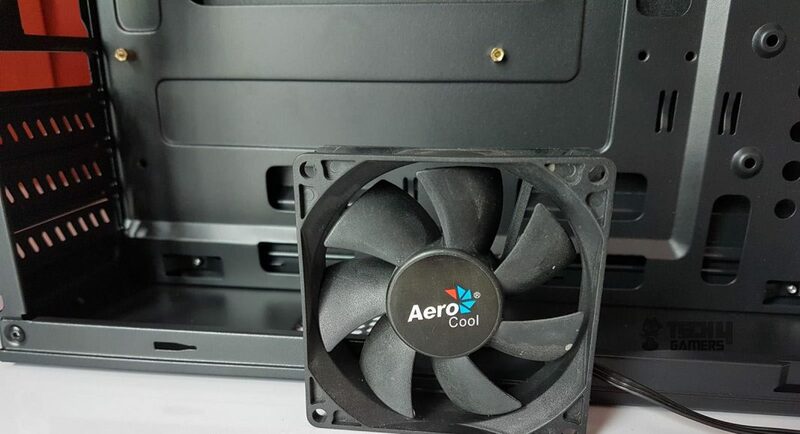 Aerocool has provided two stands with rubber inserts for vertical placement and 4 rubber feet that can be attached to the chassis for horizontal placement. 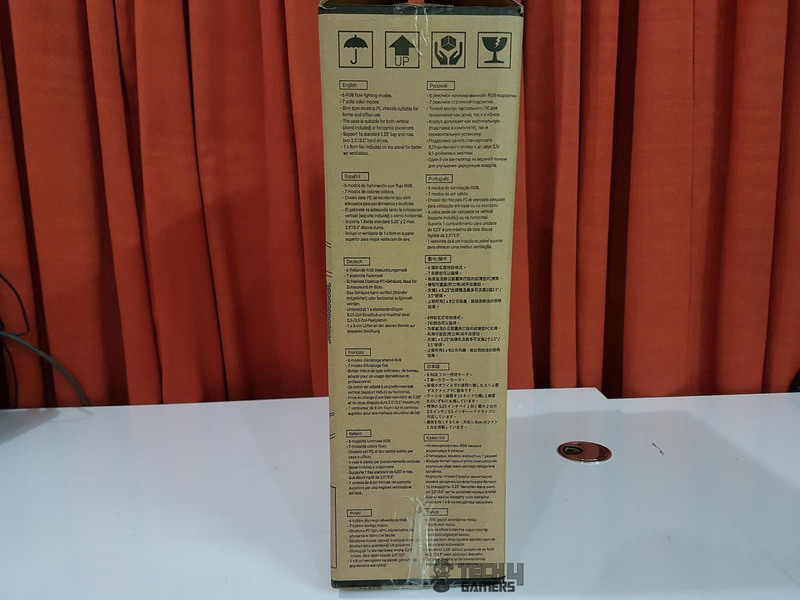 The chassis is shipped in a standard brown color packing box made of cardboard. 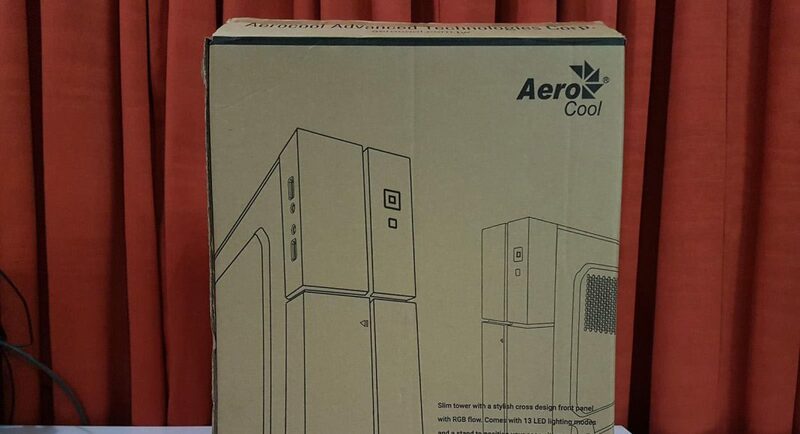 The front side has Aerocool brand logo and name printed on the top right. There are pictures of the chassis on the main section. 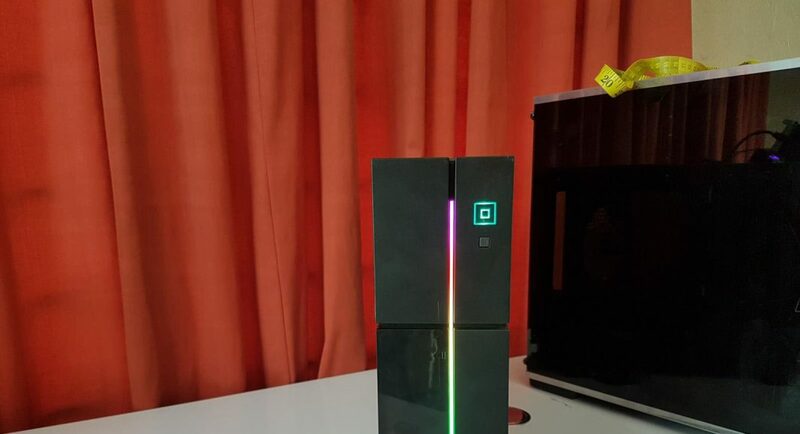 Playa Slim RGB Flow Slim Tower Case. 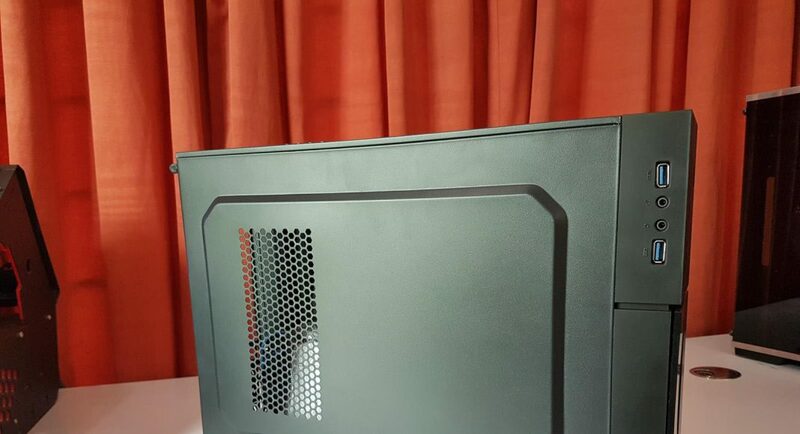 The backside of the chassis has Aerocool brand name and logo printed on the top right. There is a block diagram of the chassis showing its tear down. At the bottom, there are diagrams showing all the sides of the chassis. 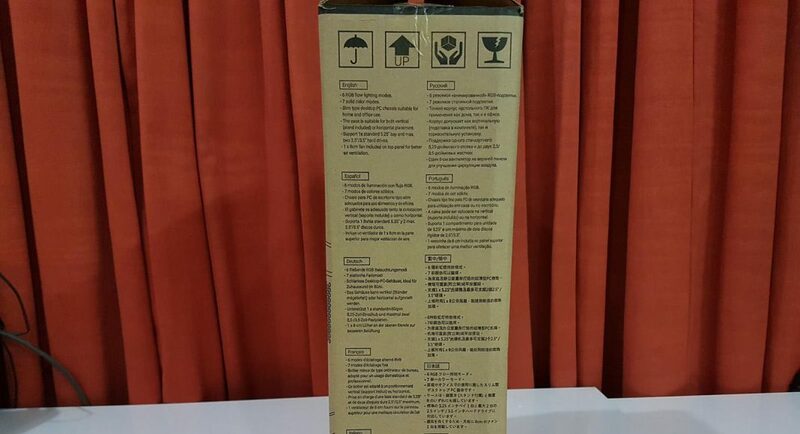 The left side of the packing box has salient features of the chassis printed in 12 different languages. 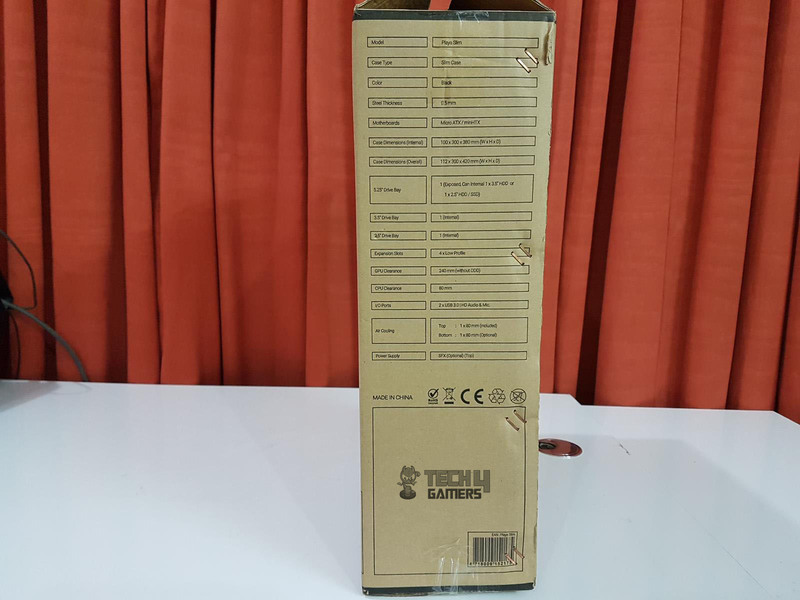 The right side has specifications of the chassis printed in a tabular format. Chassis is made in China. 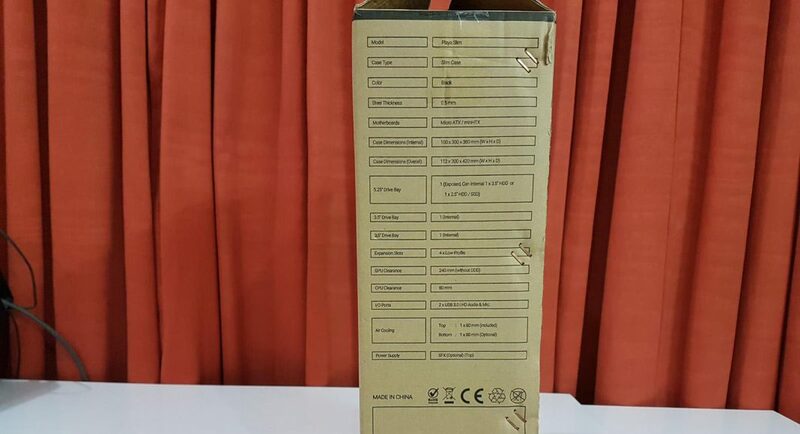 Compliance information to various regulations is printed above the bottom box. 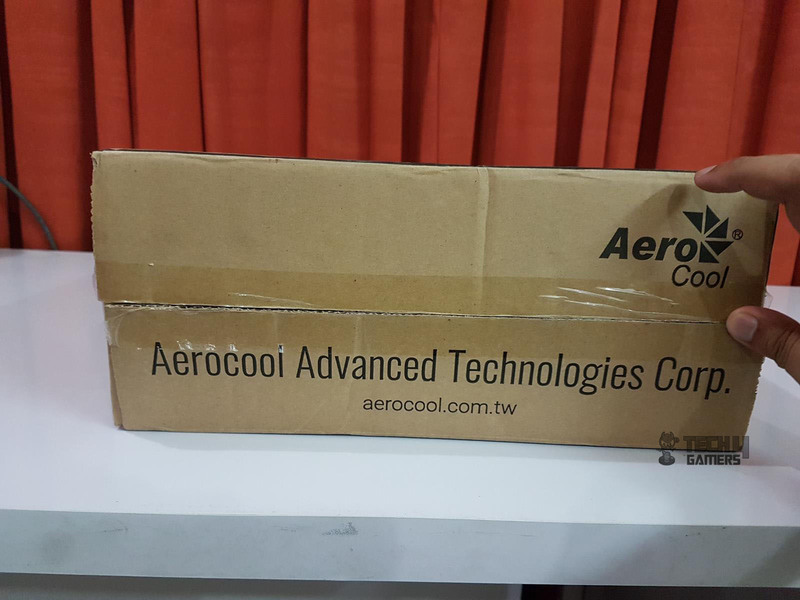 The top cover has Aerocool brand name and logo printed on the top right and Aerocool Advanced Technology Corp at the bottom. 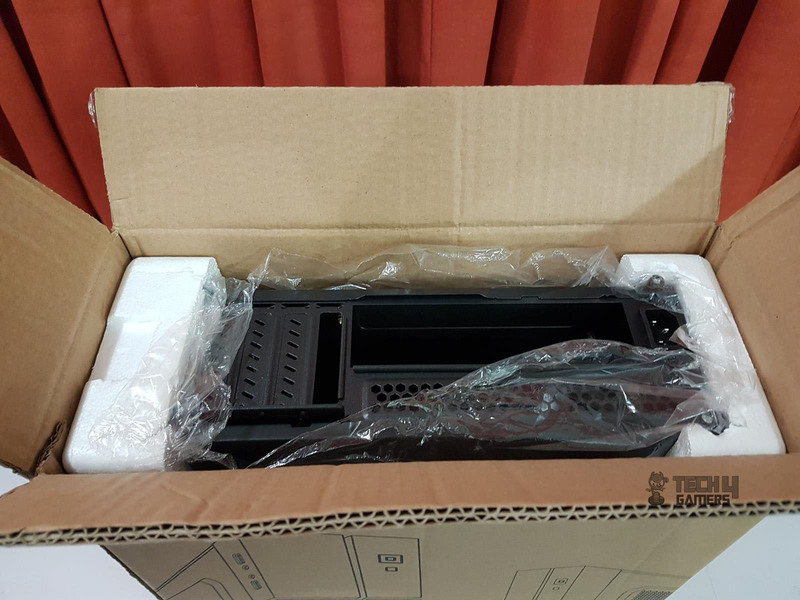 Opening the box will show the chassis wrapped inside a transparent cover and nicely tucked between two white color Styrofoam. 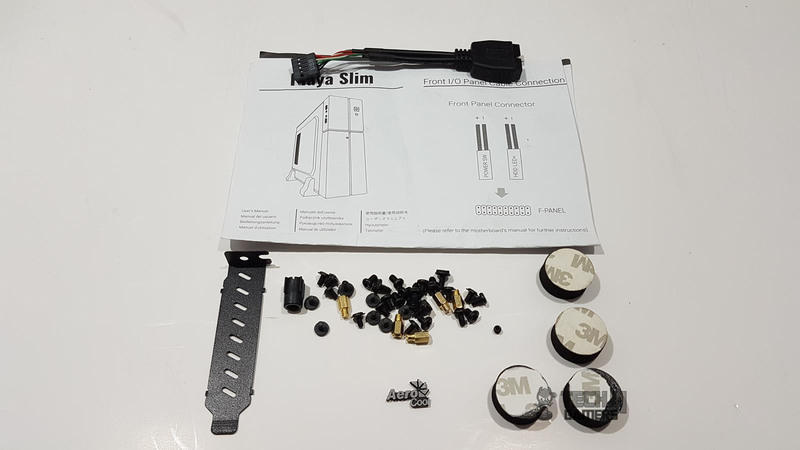 The Aerocool has provided a user manual to help in installation inside this chassis and a bag full of various screws, standoffs, 4 rubber feet, YSB 3.0 to 2.0 converter cable. 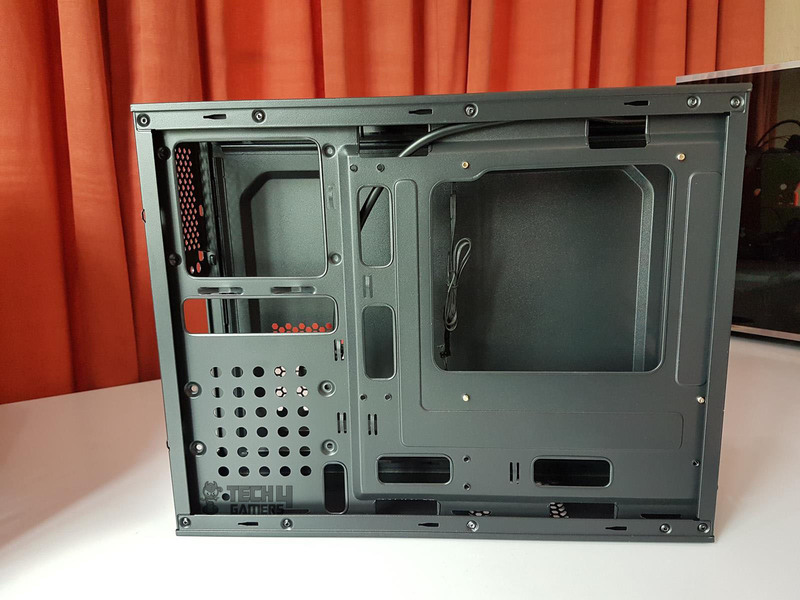 The Playa Slim is a new PC Chassis from the Aerocool with focus on medium to a low budget range of the segment. 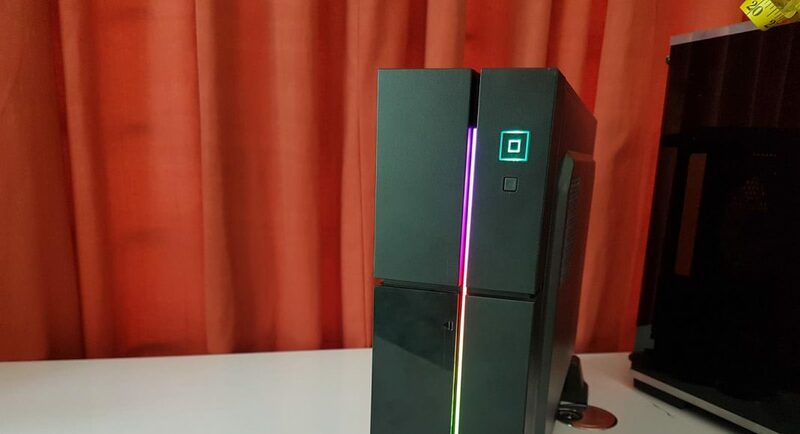 It is a slim tower case packed with cross design RGB flow on the front side to create one heck of a stunning look to the chassis. The chassis is made of steel and plastic. It has a dimension of 112x300x420mm (WxHxD). The internal dimensions are 110x300x380mm (WxHxD). Steel thickness is >0.5mm. 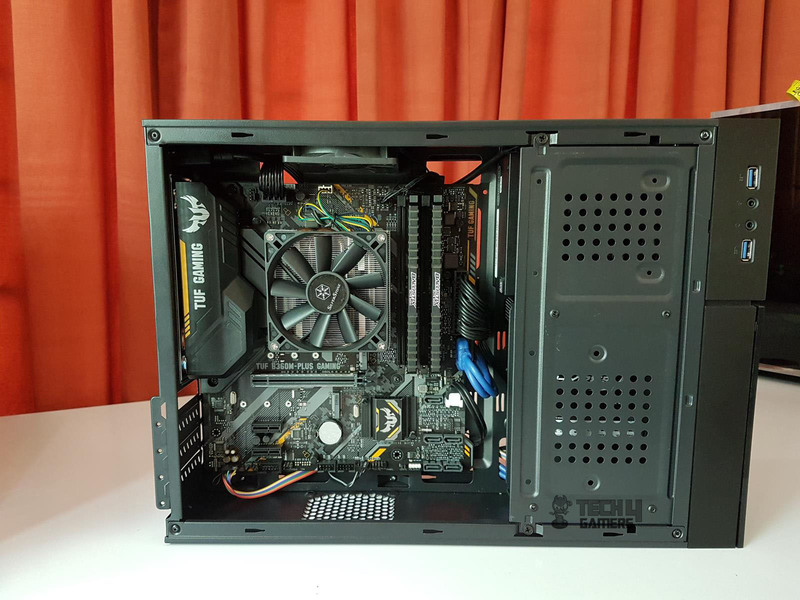 This chassis can accommodate MicroATX and mini-ITX motherboards. 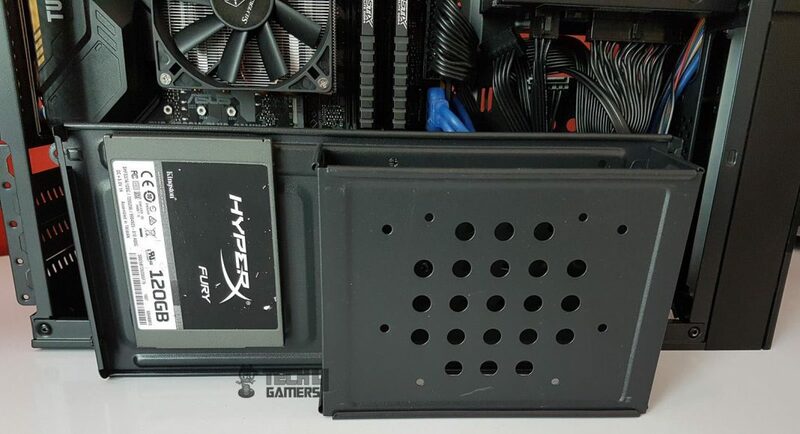 In terms of cooling, there are two 80mm fan slots. One is on the top and one at the bottom though we encountered a problem with installing a second 80mm fan at the bottom as it was touching the pins on the lower end of the motherboard and leaving around 20mm of spacing. So, 80mm slim fan (if available) can do. 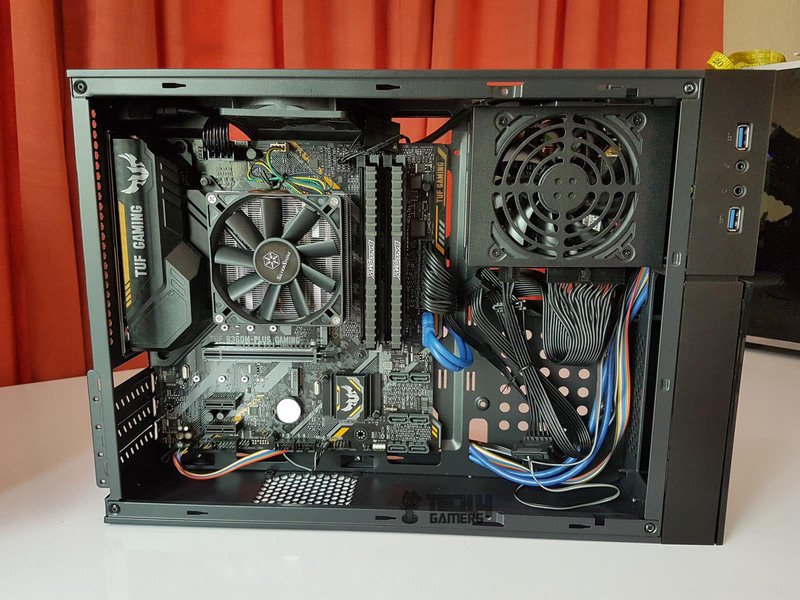 This is the case with full-size microATX motherboard only. 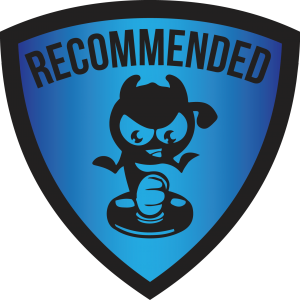 There is no such consideration for a mini-ITX motherboard. In terms of storage, this chassis has one 2.5” SSD and 3.5” drive bays and one 5.25” drive bay. 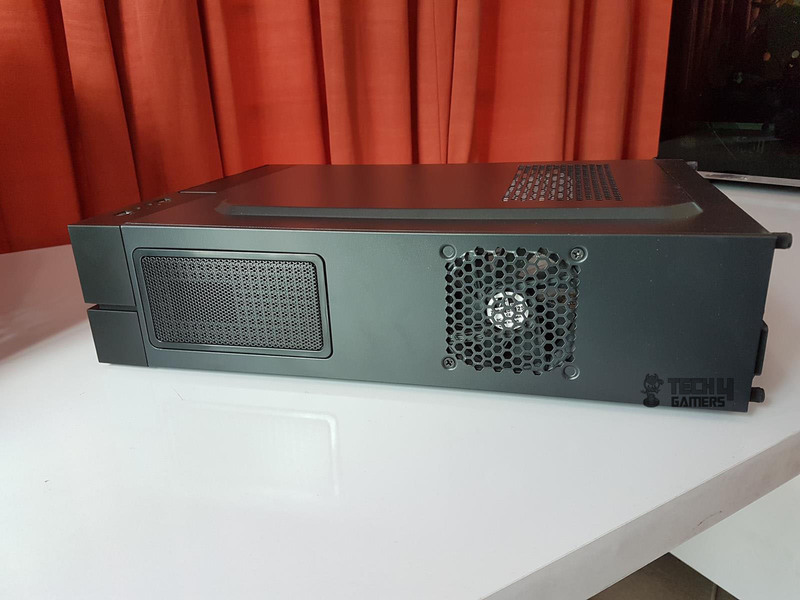 This chassis has 4 low profile PCIe slots with a maximum length of the graphics card limited to 240mm without ODD. 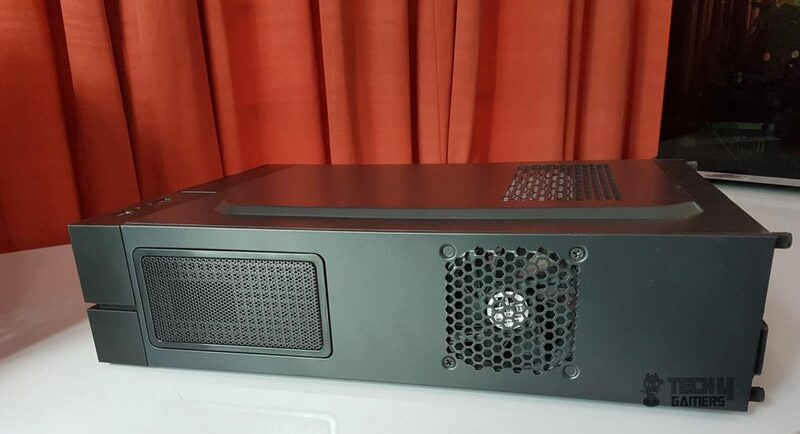 Only SFX format PSU can be installed in this chassis. There are two USB 3.0 ports and Audio jacks on the left side mounted I/O panel. Here is what Aerocool is saying about it, “This slim tower case gives you the freedom to game anywhere, whether it be your bedroom, gaming room, or the living room. With an ultra slim and compact profile, the Playa Slim has a sleek and modern look without compromising performance. 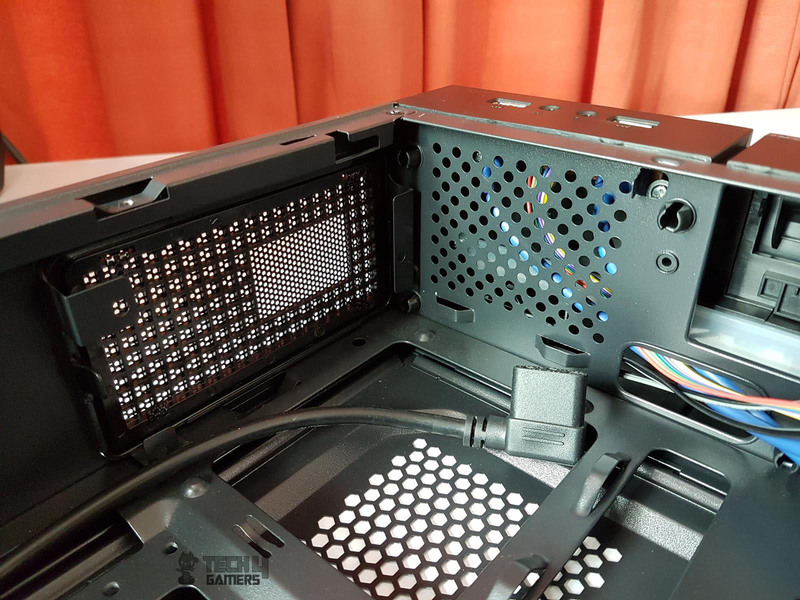 Its unique cross design RGB LED front panel displays 13 stylish lighting modes, 6 RGB flow, and 7 static color modes.” It is time to take a closer look at this chassis. Let’s start with the front panel as it is a show of the day. 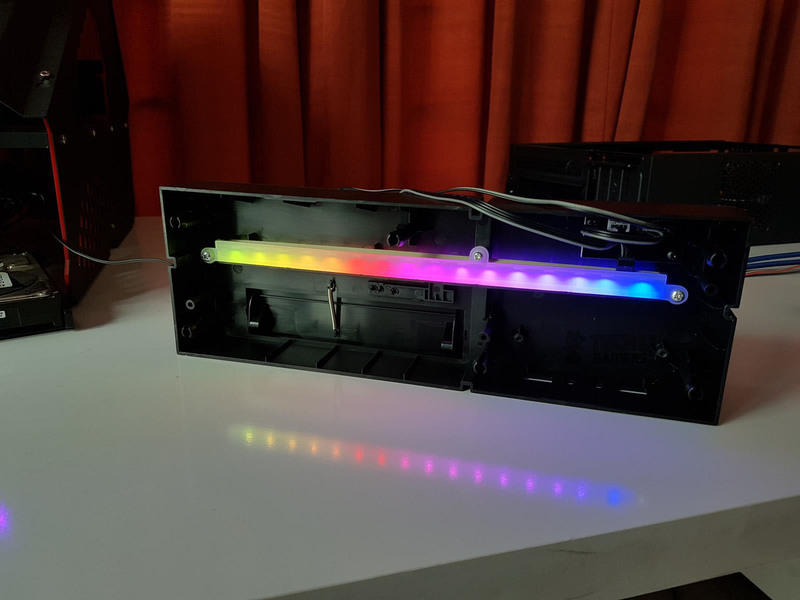 Featuring an RGB solution in a budget chassis is a good incentive and encouragement for the budget user. 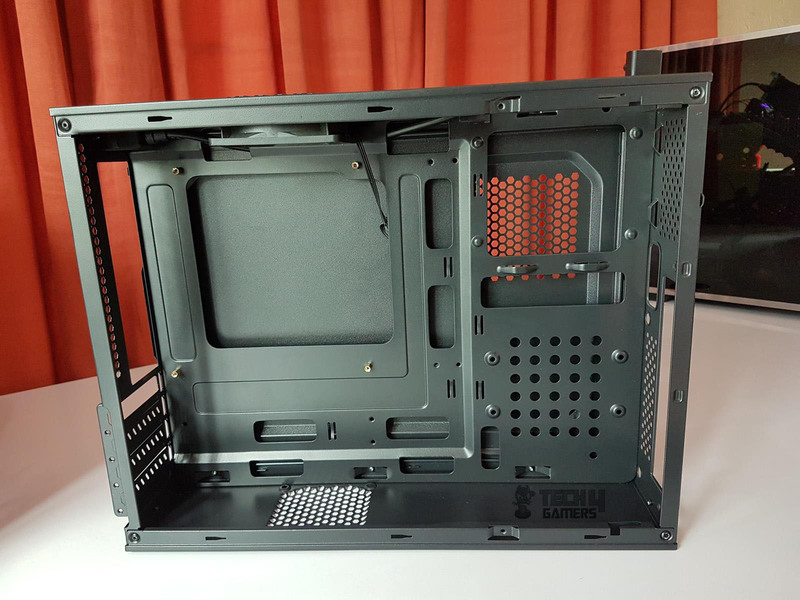 The front panel is entirely made of the plastic body and measures 290x39x99mm (LxWxH). The cross design adds much more to the subtle looks on the front. To keep the looks clean on the front side, the I/O panel is on the left side of the front panel (if placed vertically). There are rectangular boxes on the front side with the top left one having a shiny finish while the others are in the matte finish. 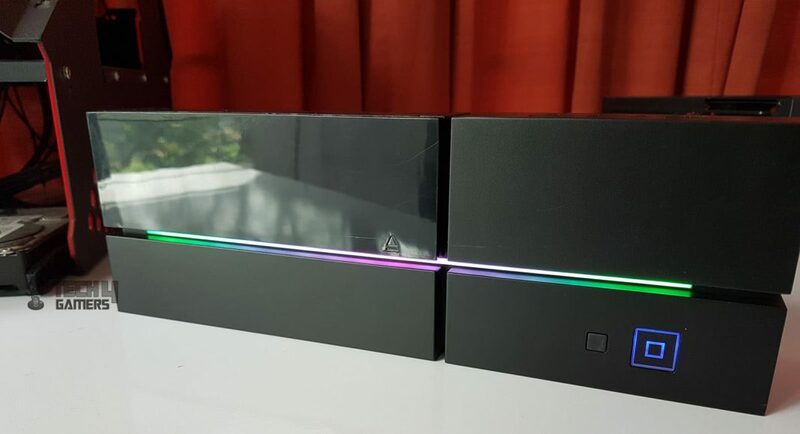 The shiny one has a ∆ symbol on its bottom right side. This is basically a cover for a 5.25” drive bay. It has a spring catching the front door. It seems like our sample has a bit of losing spring as the door cover was not fully aligned with the rest of the boxes on the front. These rectangular boxes are for design and aesthetic only and other than 5.25” drive cover there is no functionality to them. 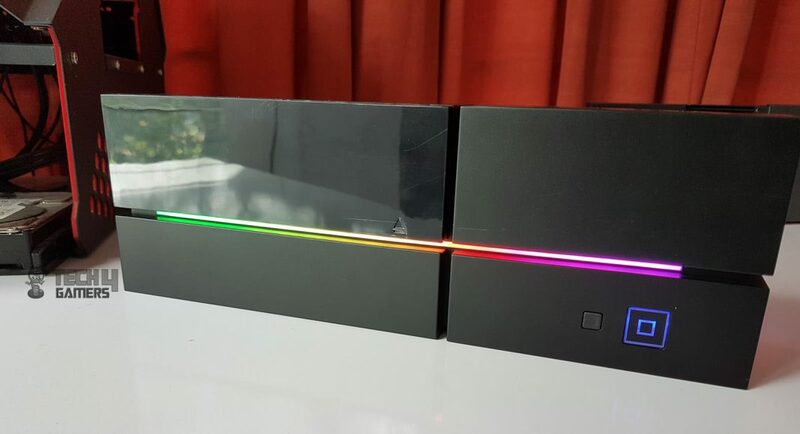 And since we are seeing a cross design, there is a gap between all 4 boxes (horizontally and vertically). The horizontal gap has as a frosted white color diffuser as can be seen in the pictures. 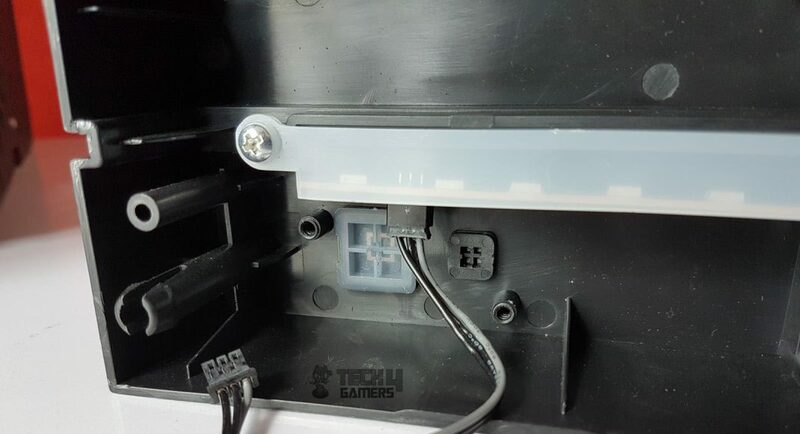 This diffuser is right above the LED strip on the inner side of the chassis. 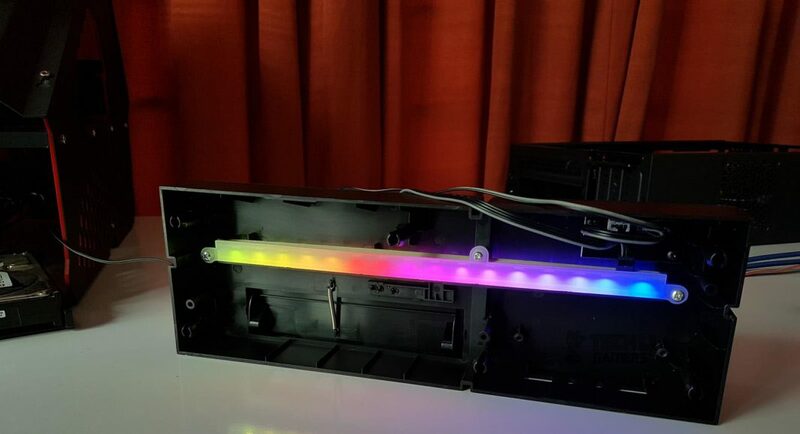 The overall majestic looks on the front panel come from this cross design coupled with fantastic RGB lighting illumination. There are two buttons located at the bottom right of the fourth box. The small button is to switch between lighting modes and the large size button is to power on the system. It illuminates in static blue color. 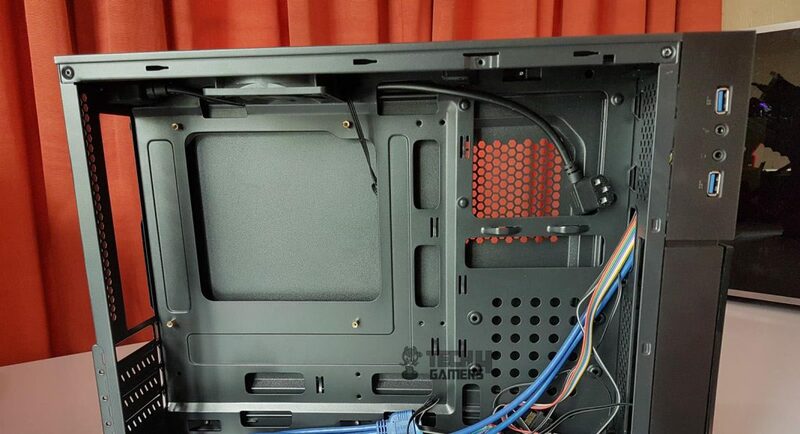 Let’s take a look at the inside of the front panel. The top left side of the panel has I/O ports. We can see two blue color USB 3.0 cables and 8 wired Audio Jack cable in multiple colors. The approximate length of the USB 3.0 cable is 640mm and that of Audio jack is 620mm. The I/O Panel’s PCB is secured using two screws. In the center, we can see a diffuser secured with three screws. 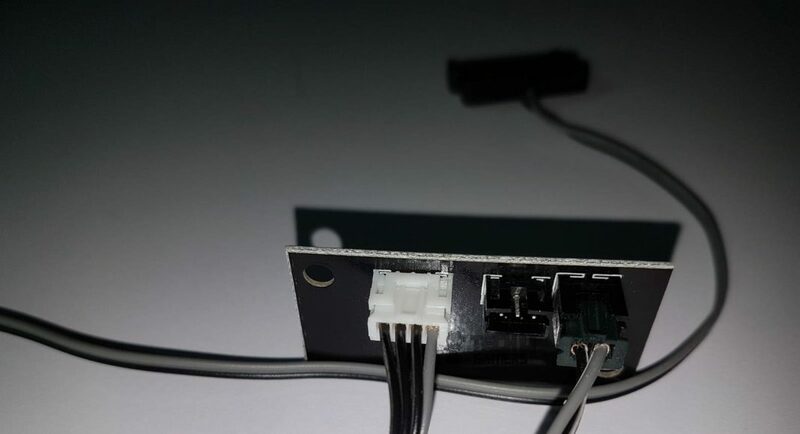 There is a three pin cable, whose one end is connected to the LED and the other to the black color PCB on the bottom left. 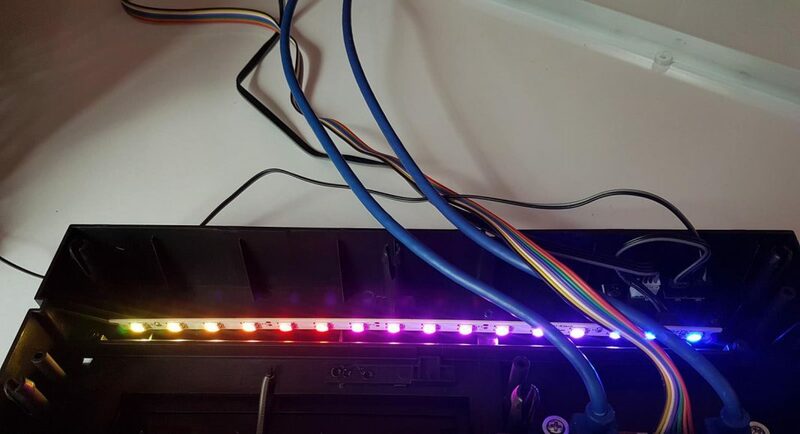 To power the LEDs on there is a SATA cable having an approximate length of 250mm. The approximate length of the system panel cable is 790mm which is rather overly length. 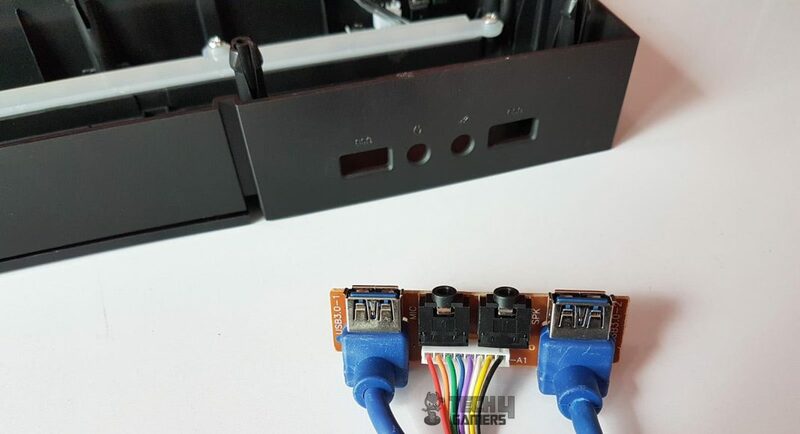 The black PCB has one SATA cable connector, one System Panel connector, and a LED connector. 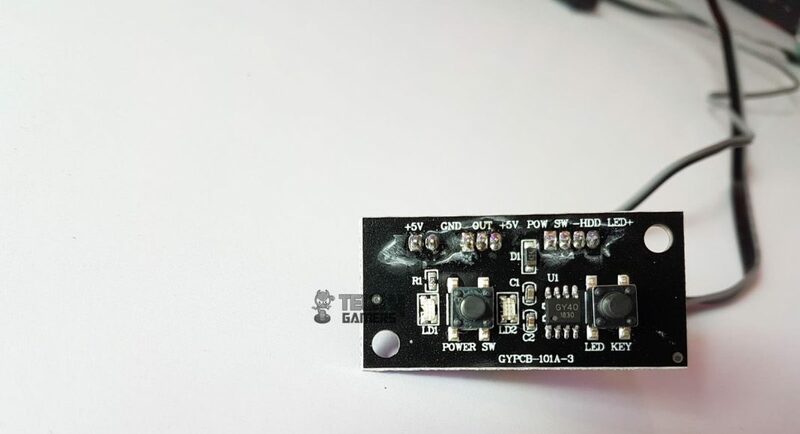 This is the PCB responsible for the action when the user presses the power button or the LED button at the front side of the panel. 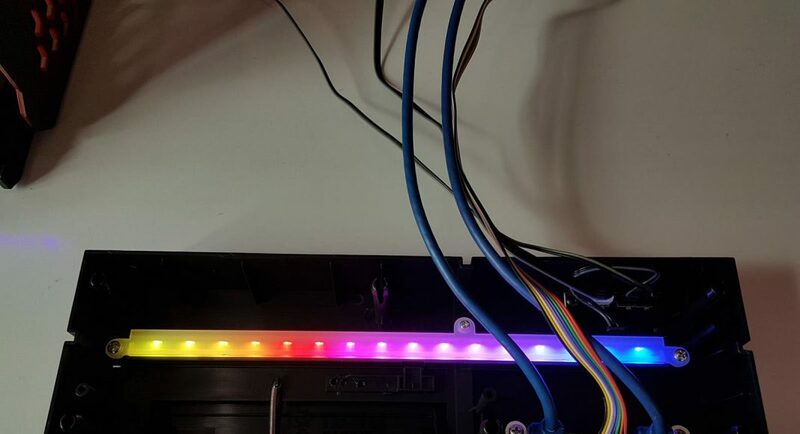 The LED strip has 16 LEDs on it. The diffuser helps to ensure the evenly lighting across the entire length. With front panel removed, we can see the perforated portion on the top side of the chassis frame. There is a cutout at the bottom left side. This is where the 5.25” drive is passed through. The bottom right side is also perforated and there is a small cutout above it to route the I/O panel’s cables through it. The front panel is secured to the chassis frame using 6 plastic tabs. Now that we have taken a look at the front side of the chassis, let’s take a peek at the top side. It is a simple layout. 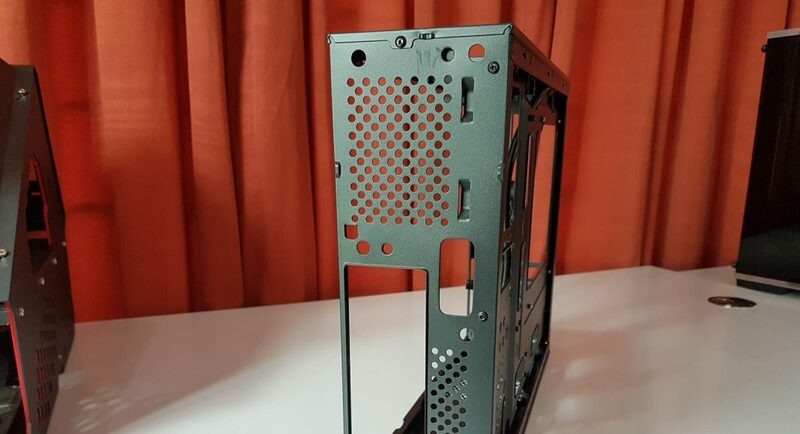 We have perforated fan area on the left side with only two mounting holes diagonally. An 80mm fan is pre-installed. The other two are solid. I have no idea why they have taken this route though two screws are enough to hold an 80mm fan. The included fan has 7 blades. The frame is made of plastic and it has no anti-vibration rubber pads. The backside of the fan shows a 4-arms assembly. It seems like ZETA is OEM of this fan as can be seen on the sticker pasted at the center. 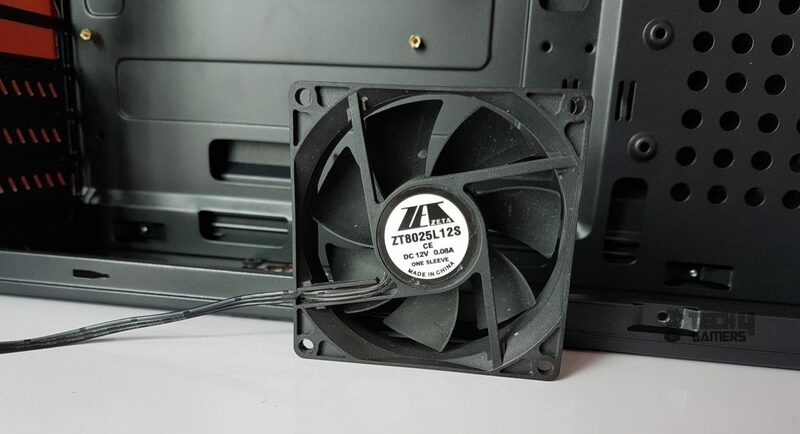 ZT8025L12S seems to be a part no of the fan. 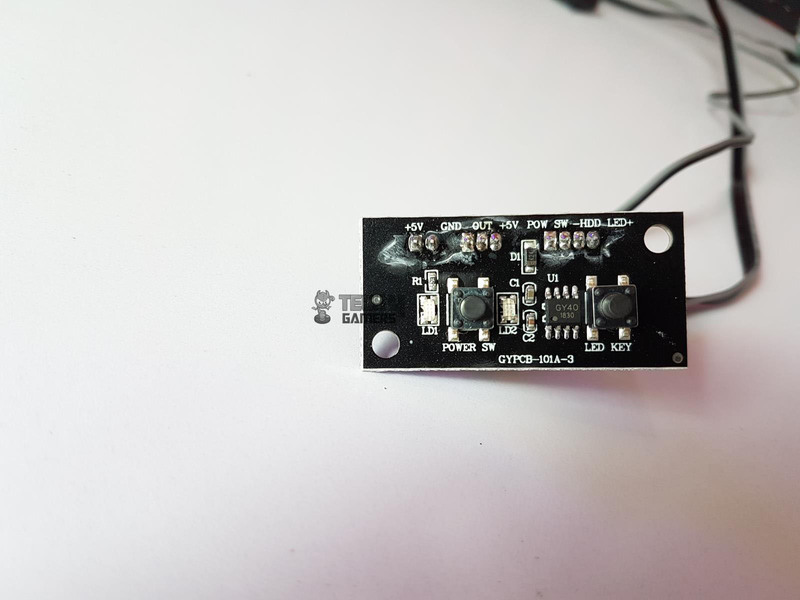 It takes 0.08A at 12VDC. 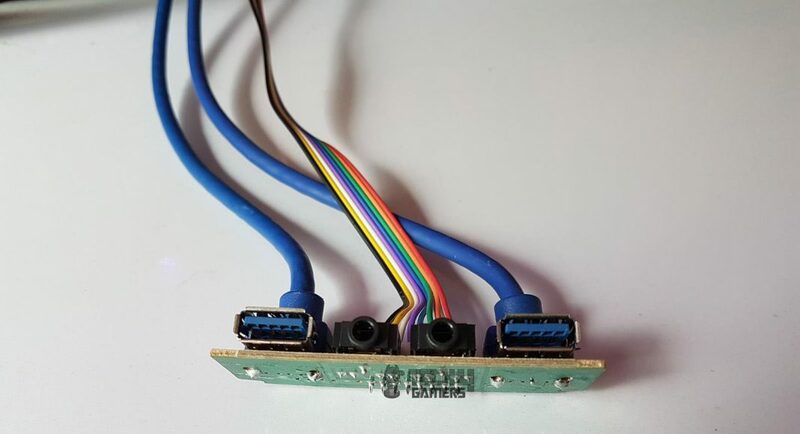 The fan has three pin connector as well as 4-pin Molex connector. The length of the power cable is 454mm + 40mm. 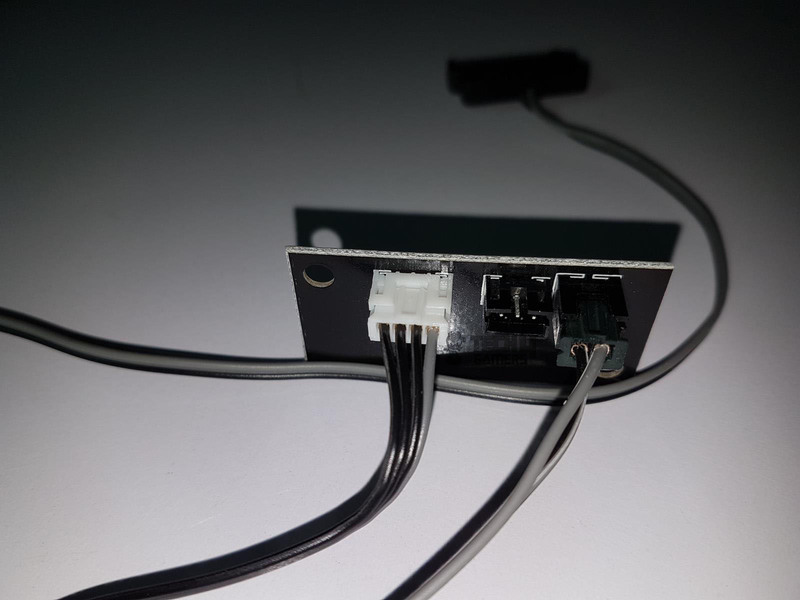 The 40mm is the one for the Molex connector and this is too short a length to properly manage the cable if using the 3-pin connector to power the fan. 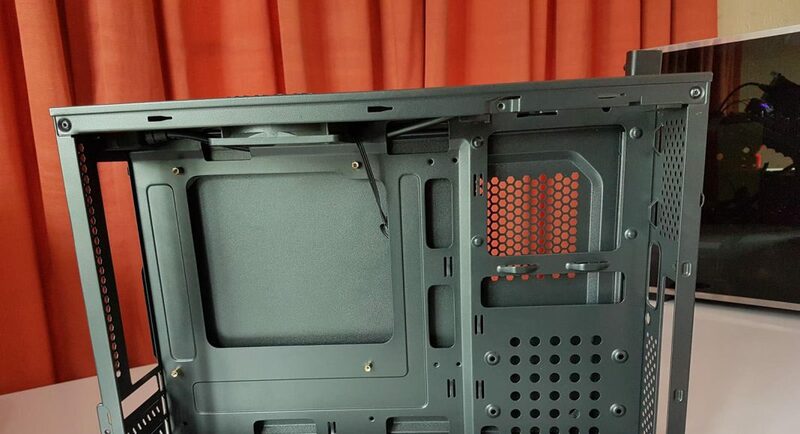 There is a perforated mesh cover in black color on the right side. This is covering the PSU mount in this chassis. 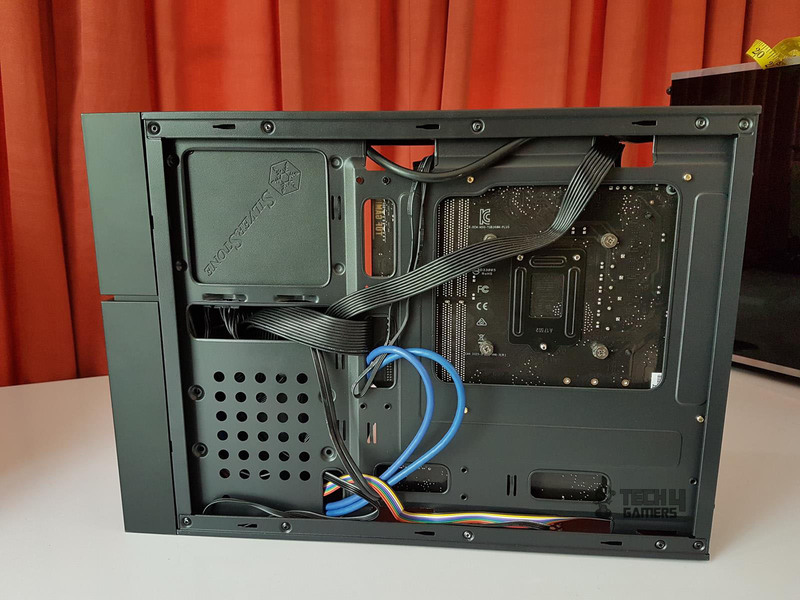 As we have a compact layout, PSU mount is not where a user would think it would be. We will take a look at it in detail in coming paras. Let’s take a look at the bottom of the chassis. The complete panel is solid except for the area with another 80mm fan mounting. It is identical to what we saw on the top side. 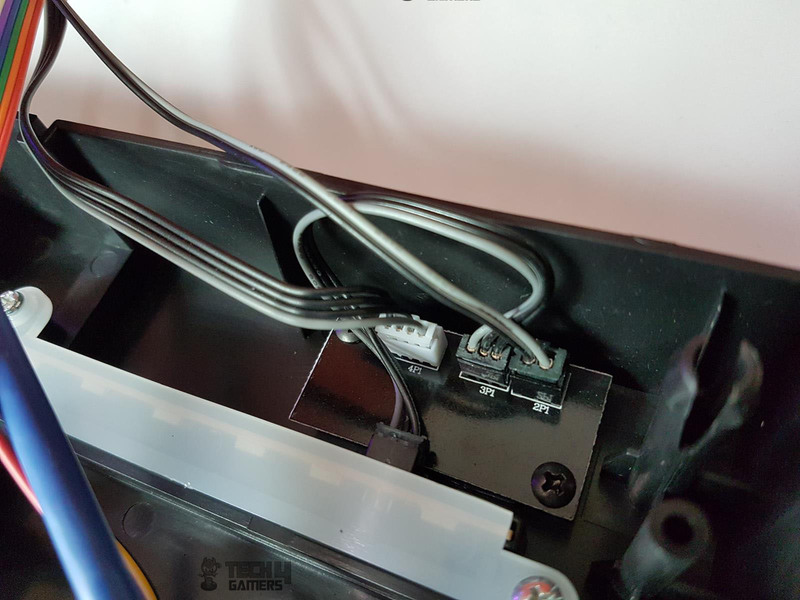 The rear side of the chassis has a 3-pin Power plug connector up top on the left side. This is where you will plug your PSU power cable into. The area right below it has a cutout for motherboard’s I/O shield mounting. 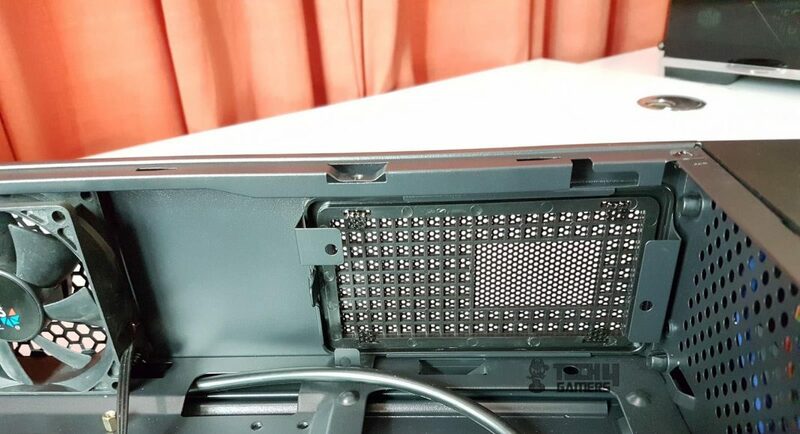 Its right side has perforation for exhausting the hot air out of the chassis. The bottom side has a Low Profile 4 PCIe slot covers with one reusable cover removed and included in the accessory bag. The slot covers once removed, can’t be put back on. These covers are vented. Let’s take a look at the left side of the panel and see what it has to offer to the builder and the user. The side panel is solid except for the perforated area measuring 74x164mm (LxH). 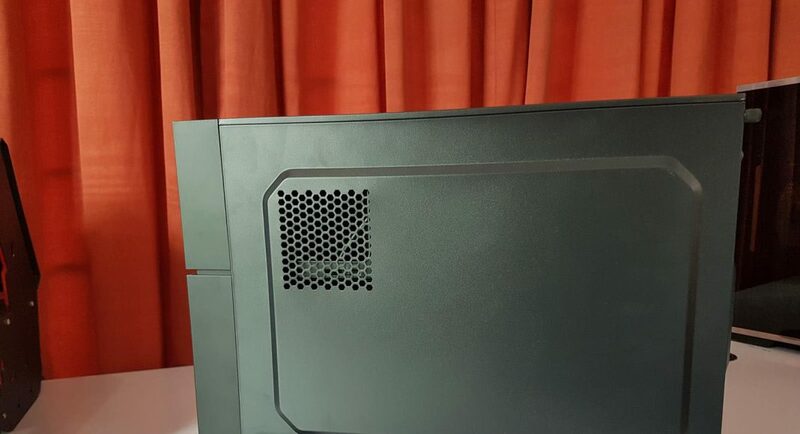 It is a good design as this perforated area faces the CPU cooler making it possible for the cooler’s fan to draw a fresh air through this perforation. The panel is secured using two thumb screws at the rear. 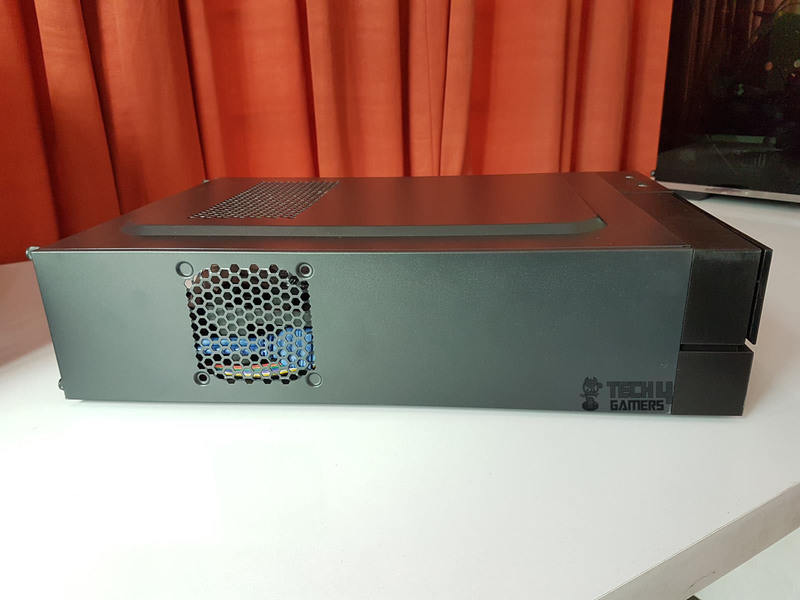 With 110mm of width, this is truly an SFF compact chassis. We can a motherboard tray on the left side after removing the side panel while the right side has a drive rack. This is actually a smart design which I must appreciate. 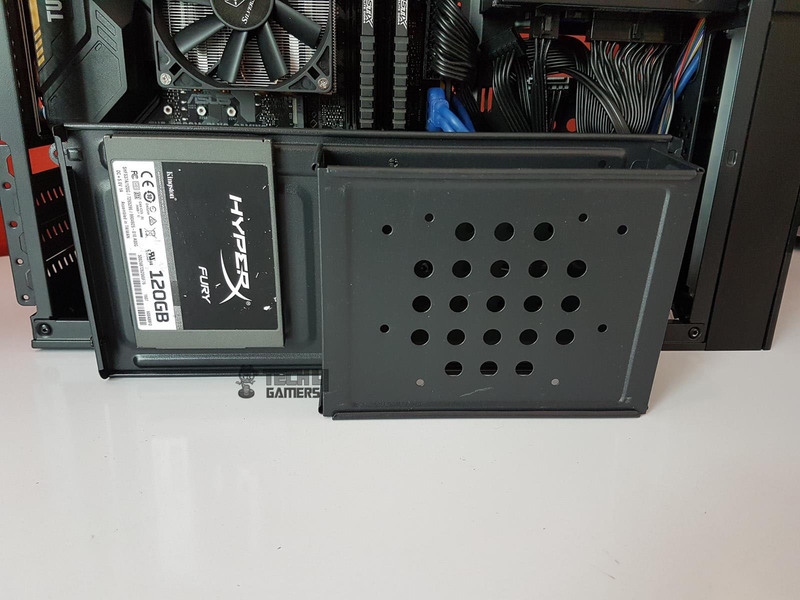 Not only we have a cover to hide the storage drives, PSU, bulk of the cables but it also serves as a storage drives holder. The 5.25” drive is slided through it. A 2.5” or a 3.5” drive can also be installed on it. 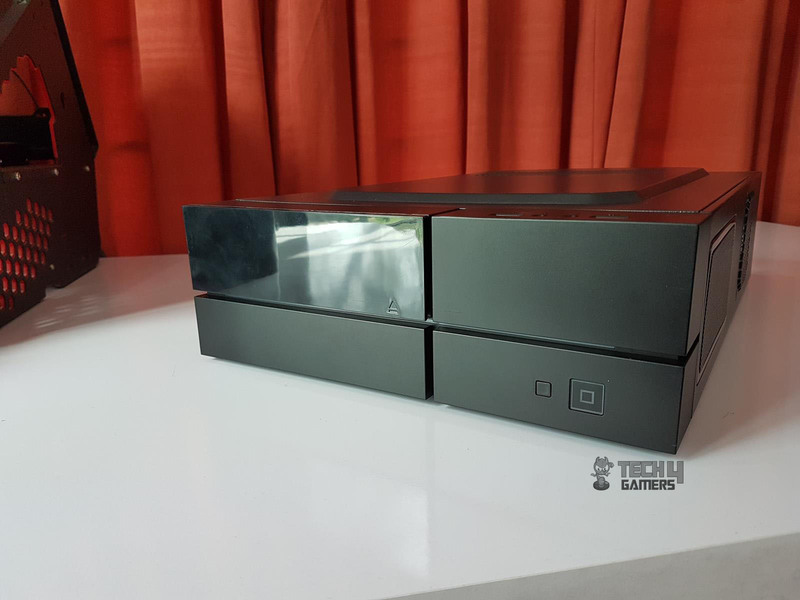 It measures 123x282mm (LxH). It is secured with the chassis frame using two screws and two screw heads (one on the top and one at the bottom). 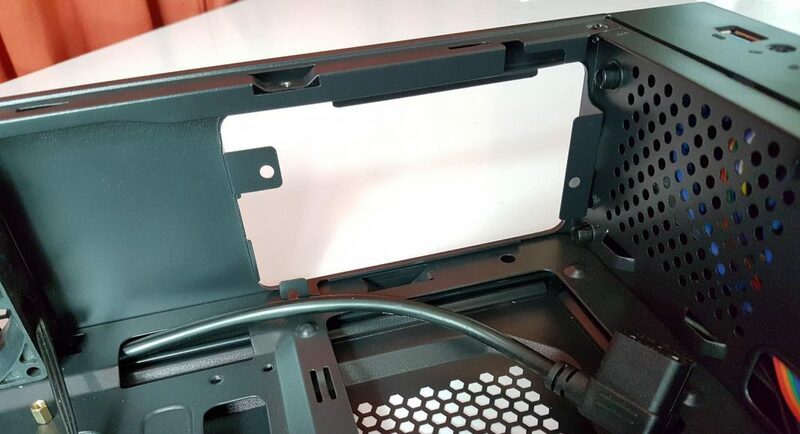 These heads are aligned with the mounting slots on the top and the bottom where they go inside the slot and the user has to slide the cover bracket in. Looking at the motherboard tray we have two cutouts up top, two on the right side and four at the bottom in a row of two each. 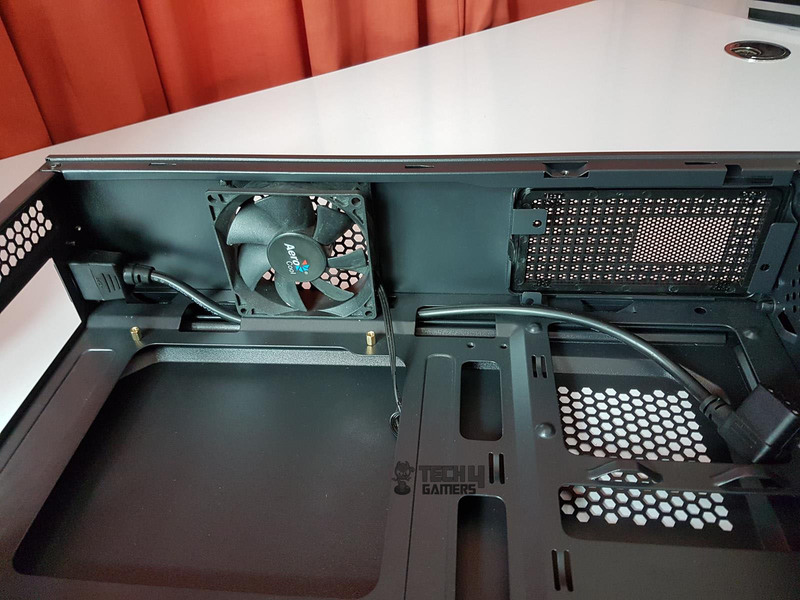 There is a large size CPU cutout in the tray to easily install the CPU cooler without much hassle. The area of the motherboard tray only measures 242x236mm (LxH). Four gold-colored standoffs are pre-installed. 7 more can be installed as per the requirement and are provided in the accessories. The Aerocool has also provided a black color hard plastic made wrench to install these standoffs. It is nice to see them taking care of these details but having a metallic wrench would have been nice. The motherboard tray is a bit recessed as compared to the storage and PSU mounting area on the right side. 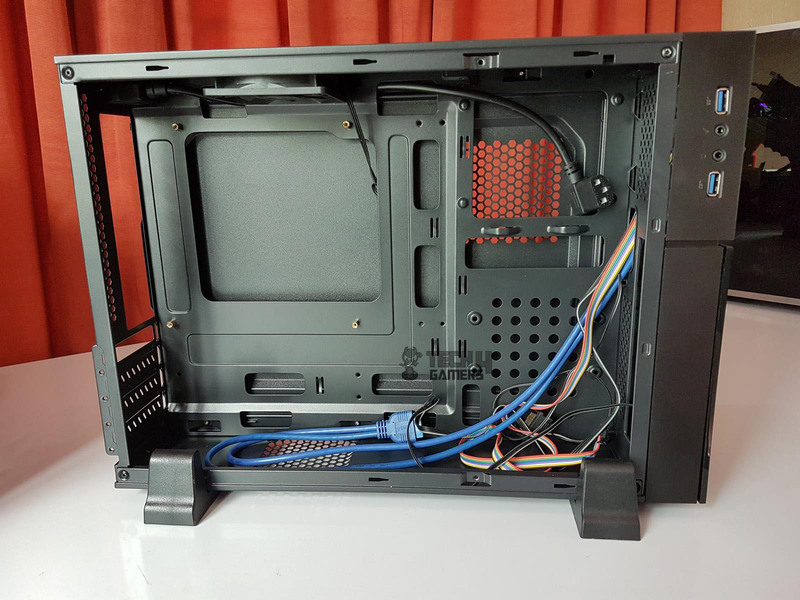 The right side has PSU mounting area on the top with three mounting holes provision. This area has a vented meshed cover which can be taken off by pressing the latch located on the left between the two brackets. This will pop out the mesh on the exterior. There are two main cutouts on the right side plate followed by a small vertical cutout at the bottom. The top one is larger of the two and this is where the PSU is installed. If you look at it the right side panel has a perforated area facing exactly this larger cutout. This is to help with the proper ventilation with respect to the PSU. 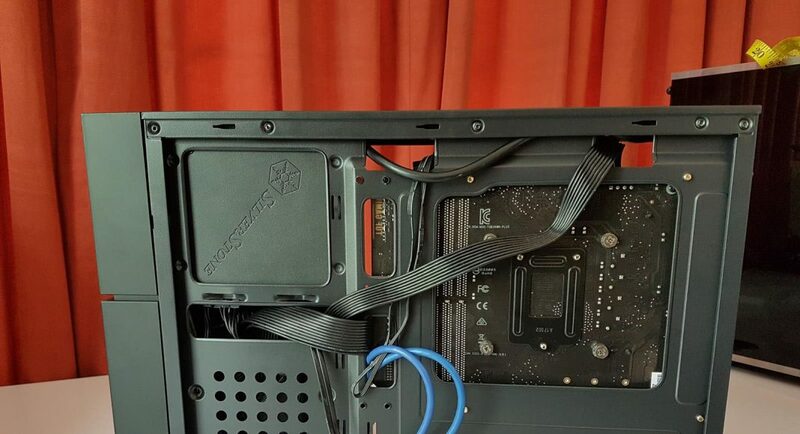 The smaller cutout is to route the cables of the PSU. The remaining portion of the right plate is perforated and it has four mounting holes to install 2.5”/3.5” storage drive directly on to the plate. A 3-pin power plug can be seen here as well. The idea is to utilize the already constrained space in an effective yet efficient manner. 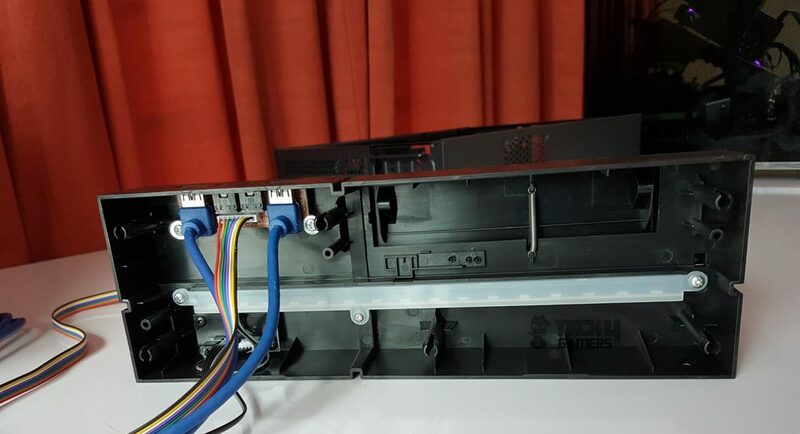 The 3-pin port on the rear side of the chassis is actually an extension power cord. The length of the cord is 320mm which is sufficient to reach towards the PSU mount on the front side. Once the PSU is installed, this cord is plugged into the 3-pin port on the PSU. There are certain aspects of this design that I will cover in the installation section. Now, let’s take a look at the drive rack. The rack is a total perforated design with multiple mounting holes. 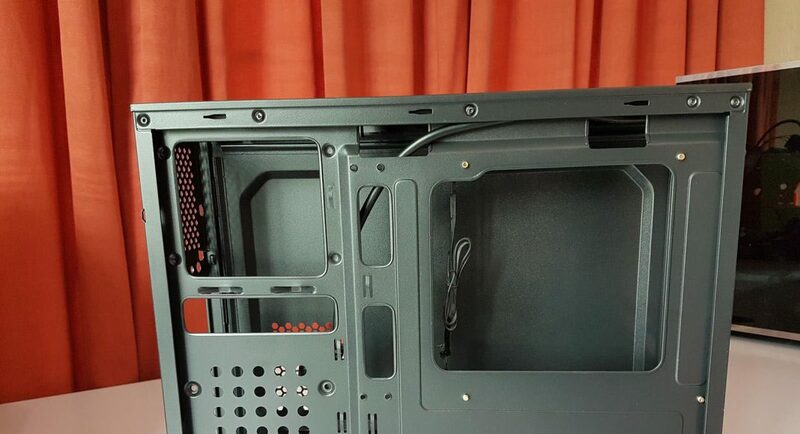 The lower end of the rack has a covered design and this is where a 5.25” drive is to be placed and secured. If the user is not using a 5.25” drive then this area can be used to install a 2.5” or 3.5” storage drive. The upper portion of the rack has a mounting for a 2.5” storage drive. 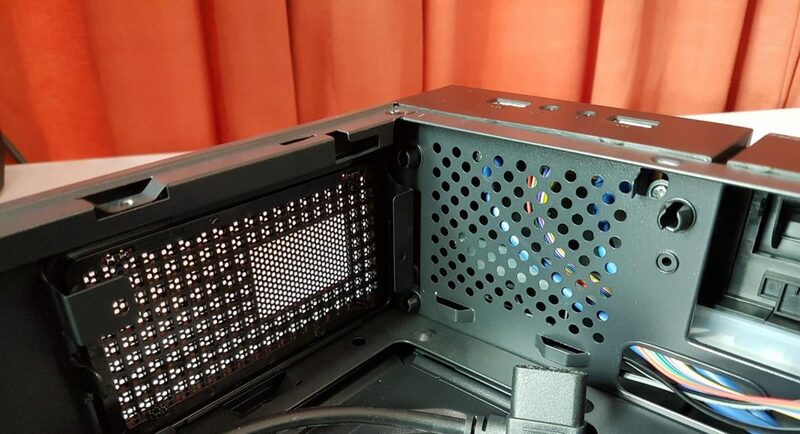 The upper portion will directly face the PSU. If the user has to use all three (5.25”, 2.5”, and 3.5”) drives at a time then it would be one heck of a challenge for the cable management. 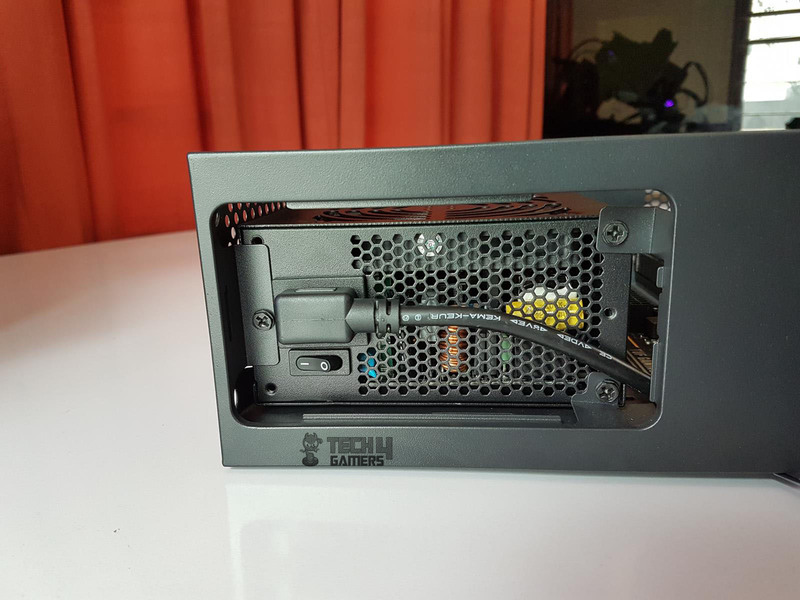 A modular PSU is what I would seriously recommend unless you are not a cable management lover. 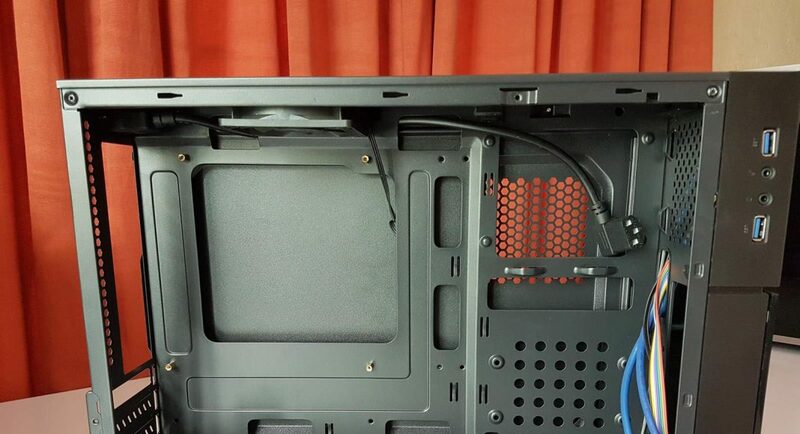 Both side panels have an indentation of approximately 7-8mm that would give a bit of the room for cable management. The backside of the chassis has 5 cable tie points. 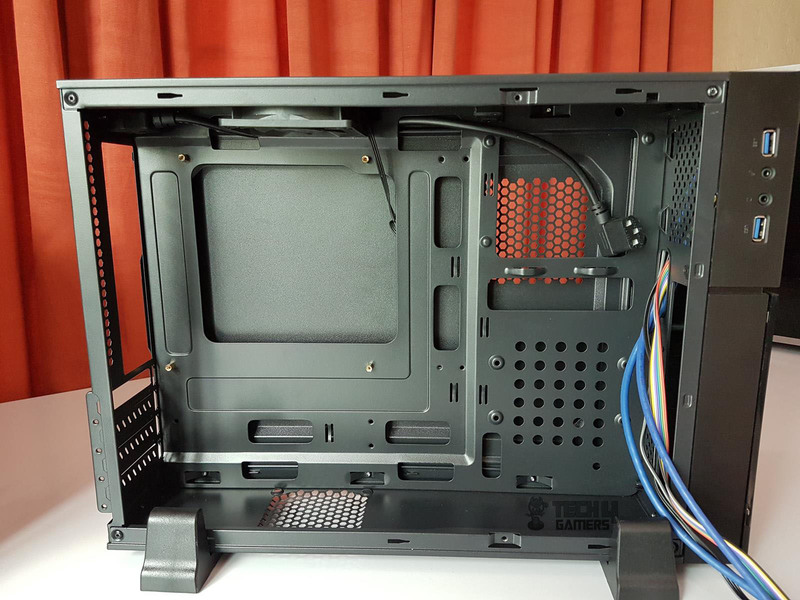 There is hardly any space for cable management other than what the indent on the side panel has to offer. Well, I can’t complain given the budget orientation of this chassis. We can see the power cord already routed through the top two cutouts. As the motherboard tray and PSU mounting area are in parallel, so you can start with either side. I started with the motherboard. I did not face any issue in the motherboard’s installation. CPU cooler was easy to install as well. I had requested Noctua for the 80mm fan for which they sent me their new NF-A80 fans. 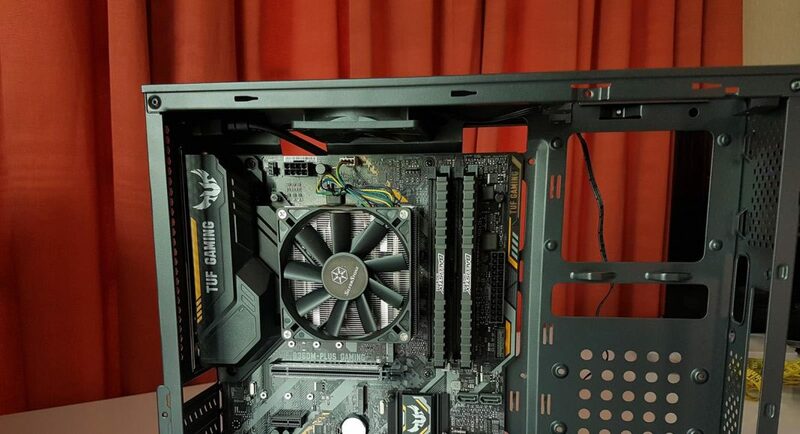 Unfortunately, I was not able to install the 80mm fan at the bottom as after installing the motherboard, there was hardly 20mm or so spacing left for the fan having 25mm of height. 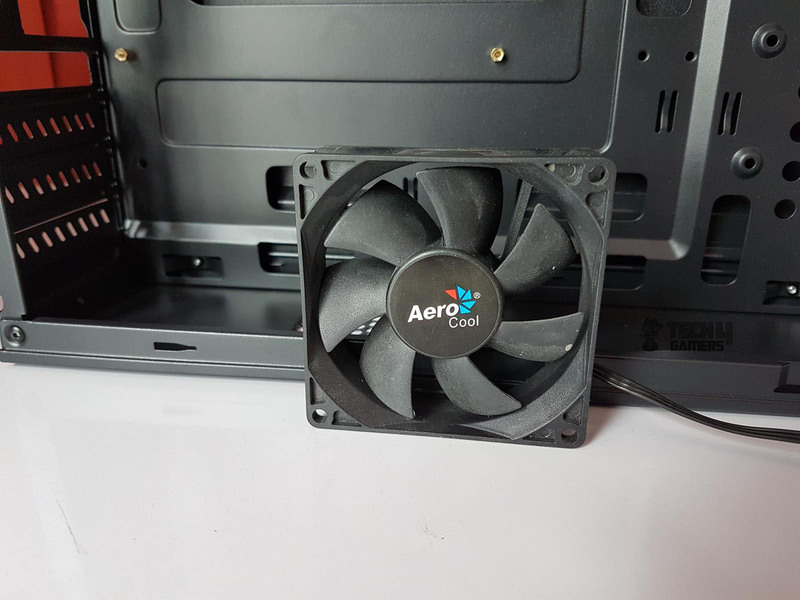 Maybe Aerocool needs to revisit their specs section on the website saying that an 80mm fan can be installed at the bottom. 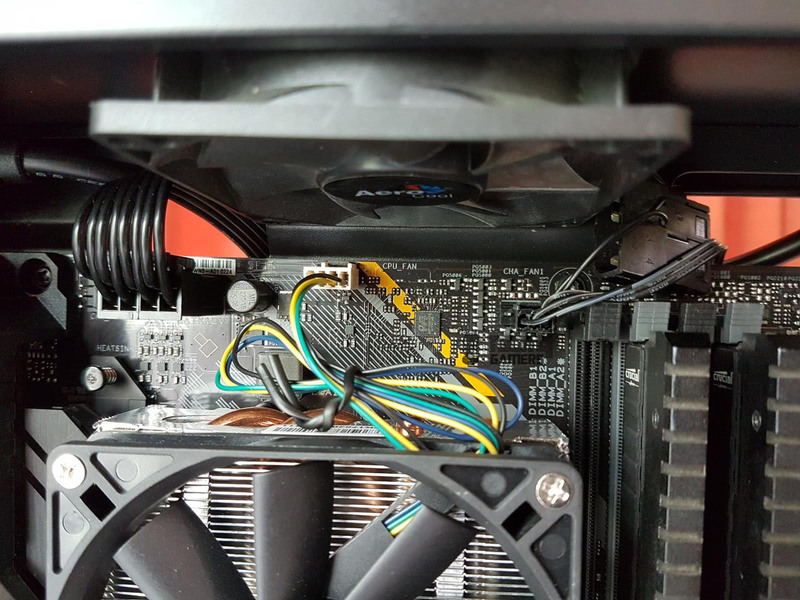 It can be with a mini-ITX motherboard but with my microATX motherboard, the fan was obstructed. 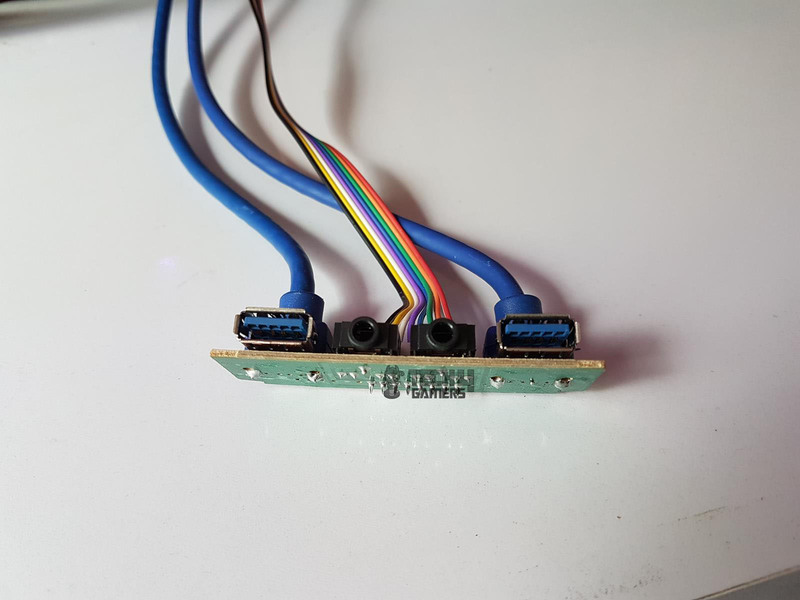 Next up, the top fan’s 3-pin connector was connected to the motherboard’s fan header. 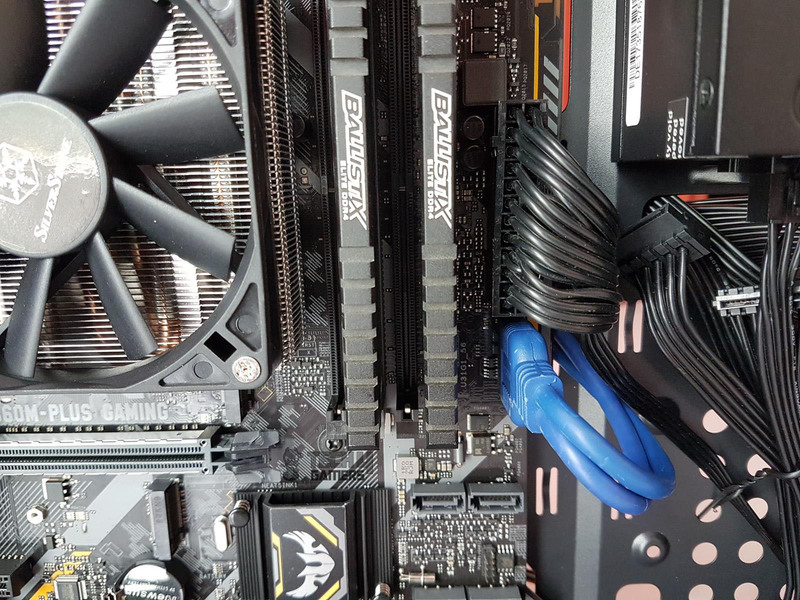 I was not able to hide the 4-pin Molex connector behind the motherboard tray due to such short length of this extension cable – a mere 40mm. Aerocool should consider increasing the length of this side of the cable. 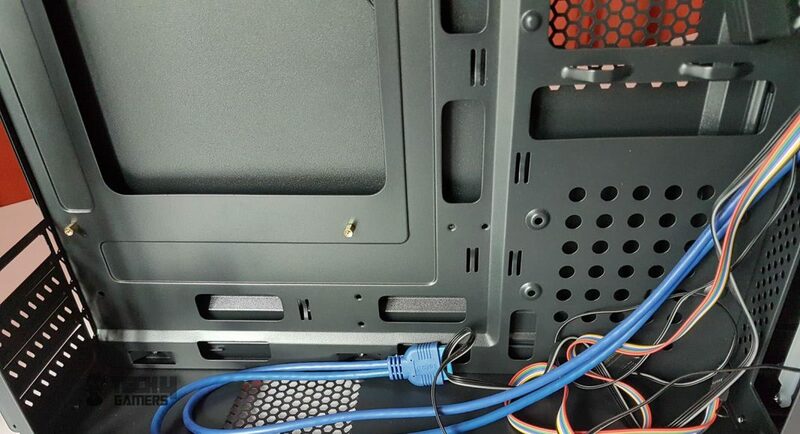 For some reason, the three mounting holes for the PSU were not fully aligned with the mounting holes on the PSU. I was able to align the two on the left side but it puts the third one out of the alignment by half of the hole’s size and I had to use a bit of force to align them before installing. 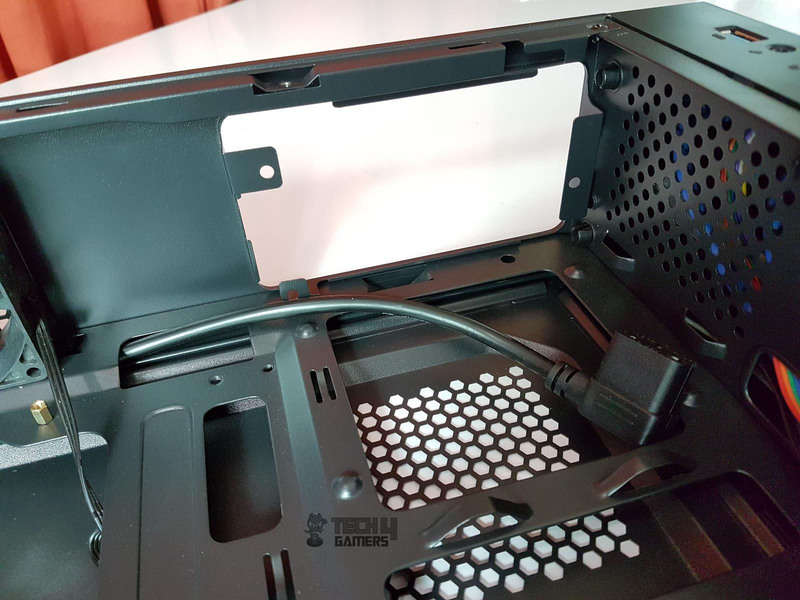 Also, take a note that before installing the PSU, route the extension power cord to the mounting area as the bulkhead of the cord will not pass after the PSU is installed. Once the PSU was installed, the cord was plugged into it. Here comes another observation. 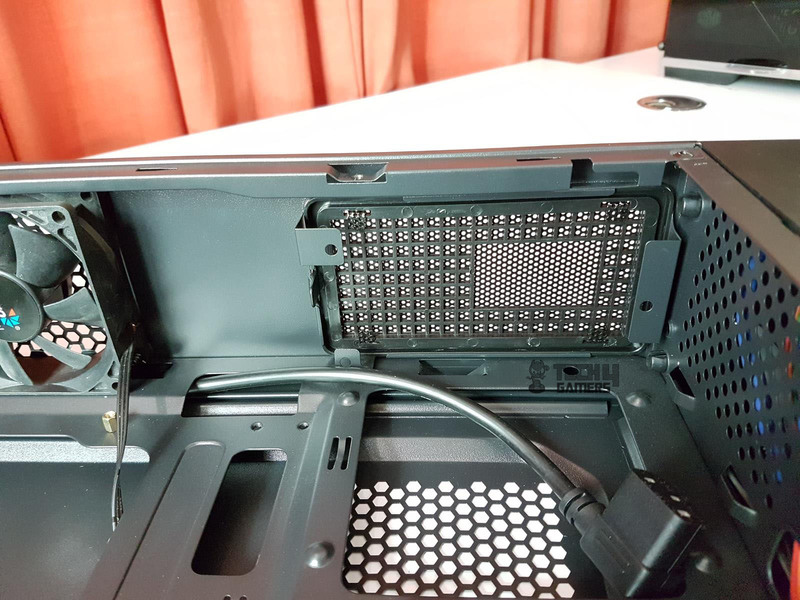 The PSU mount has a meshed cover which can only be accessed from the inside of the chassis. There is no power on/off button at the rear of the chassis as it is simply an extension power cord. 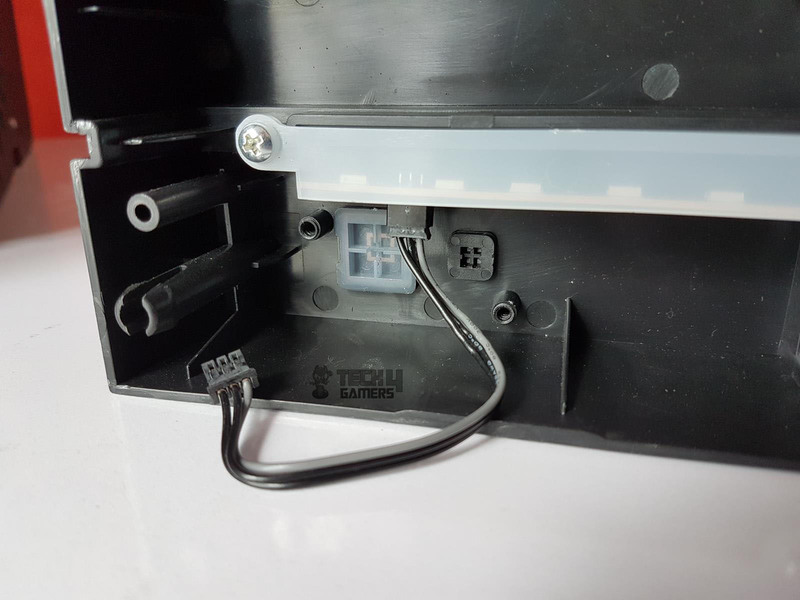 In case the user forgets to turn the power button on of the PSU, it would be quite frustrating to open the side panel and press the latch to remove the top cover and then power on the PSU button. Similarly, I usually leave my machine with just turning the PSU power button off without turning the main power source from the wallet. This design left me out of it. Also, the provided extension cord has a 90° connector. Don’t try to remove the extension cord setup and use the cord provided with the PSU as it will leave no room for the top cover. 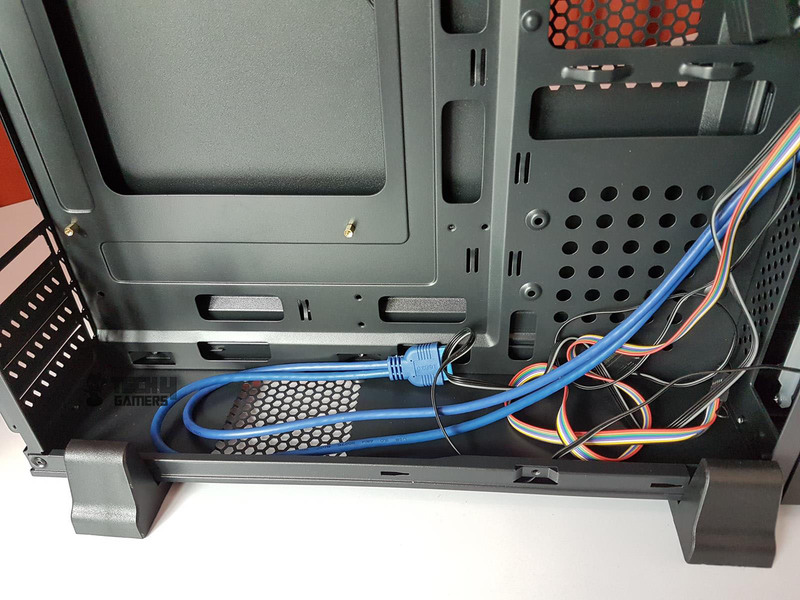 I have found the length of the I/O panel’s cables to be excessive for this chassis particularly the USB 3.0 cables and what is with the blue color cables? I would have preferred all black to give a better symmetrical and clean looks of the build. Thankfully the SilverStone PSU was fully modular and has flat cables. I love the flat cables outlook as they are preferable if not using individually sleeved cables. 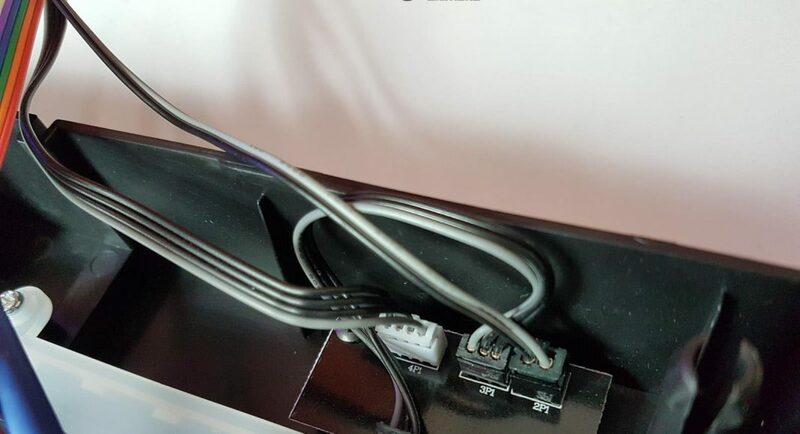 Flat cables are not bulky and can be routed through the underside of the motherboard. This is exactly what I did with my build. 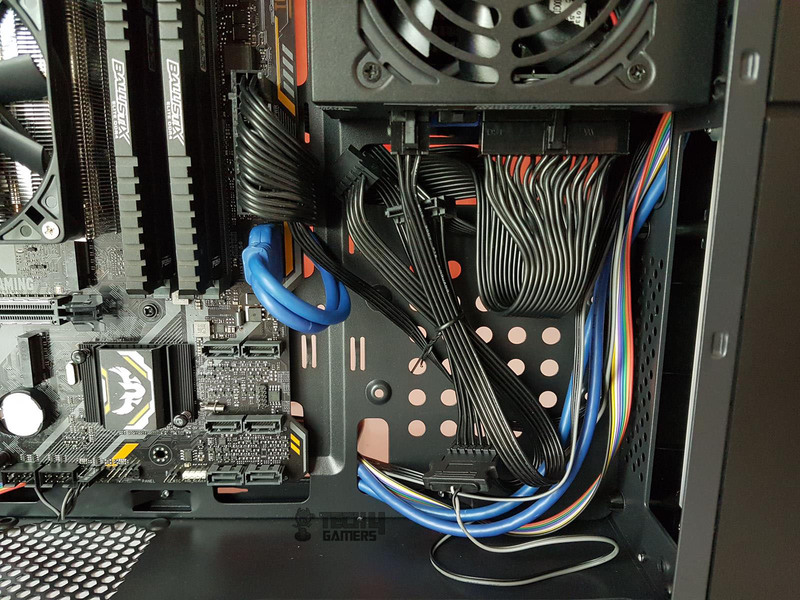 I routed the 24-pin ATX cable, USB 3.0 cable and the SATA cable from behind the motherboard though the cutouts for a much cleaner look. This would not have been possible had the 24-pin ATX cable was not flat. 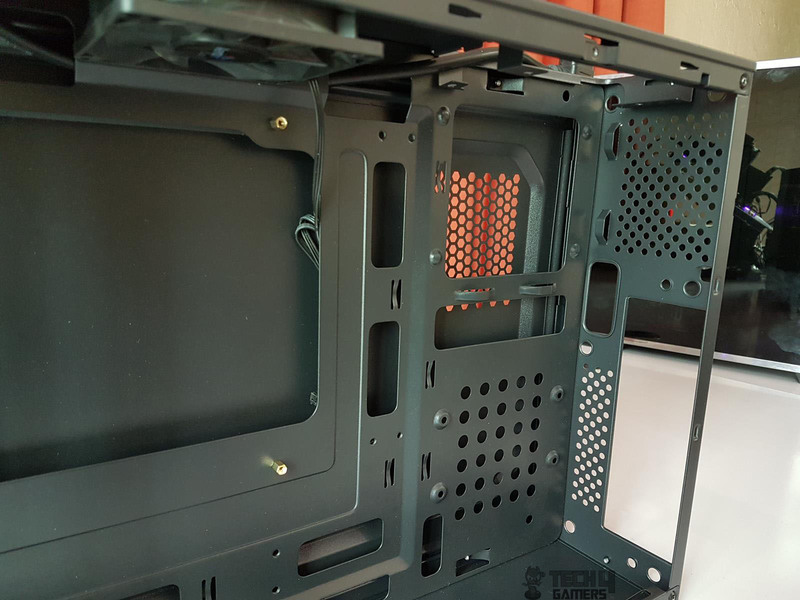 The HD Audio cable and the system panel connector cables were routed through the vertical cutout at the bottom towards the bottom cutouts under the motherboard tray for better cable management. I did not do much at the back as can be seen in the pictures. 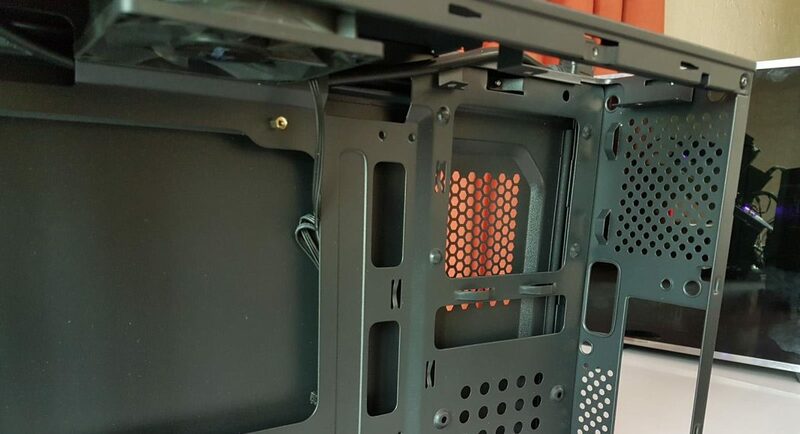 The system panel and the HD Audio cables were placed inside tight spacing between the chassis frame and the motherboard tray. 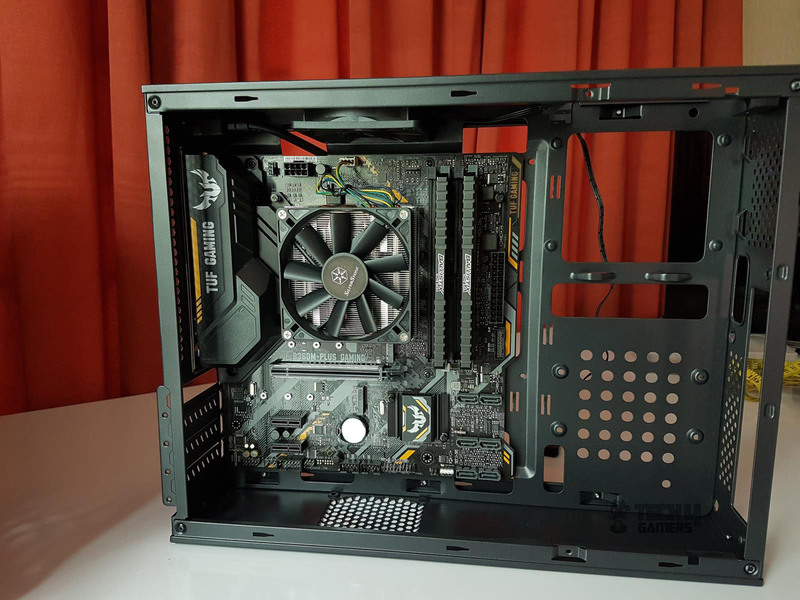 As this chassis can only support low profile graphics card, I was not able to use one in the test build as none were available in the market. 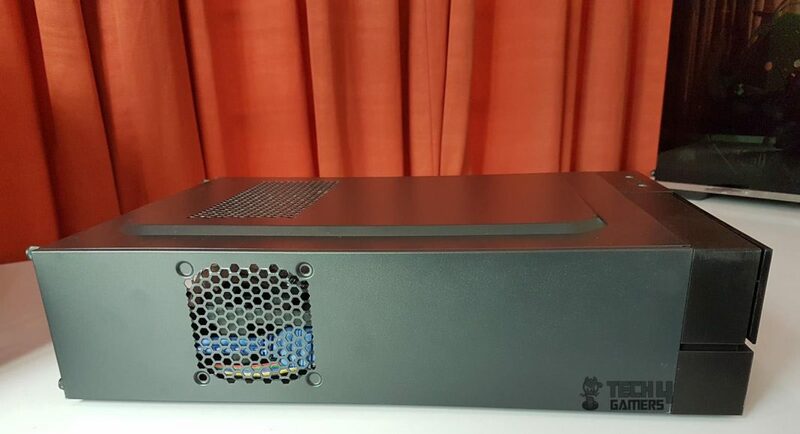 Using a non-modular PSU would be a challenge in this chassis and if that non-modular PSU happens to have non-flat cables as well then the challenge is raised to a next level. Keep that in mind when designing a build. 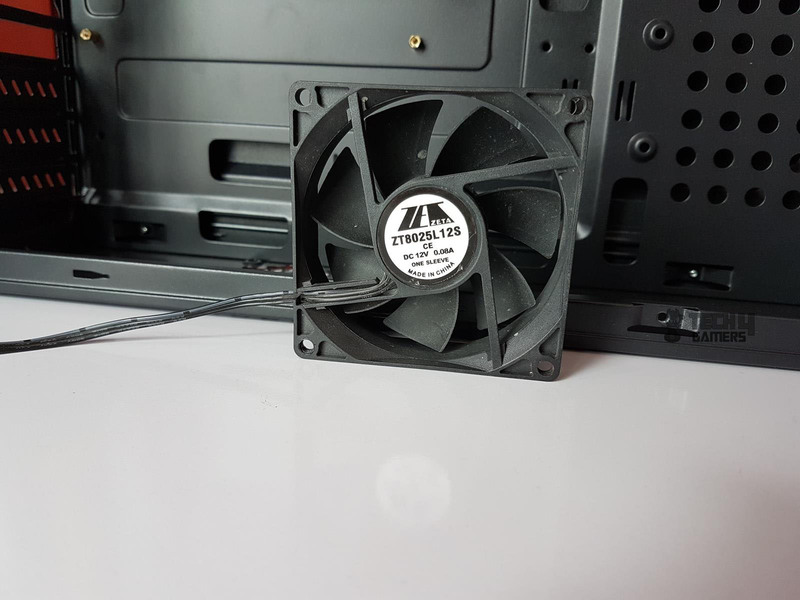 The stock fan reaches 1862 RPM maximum during the operations. Thermal testing was done using the AIDA64 for 30 minutes. 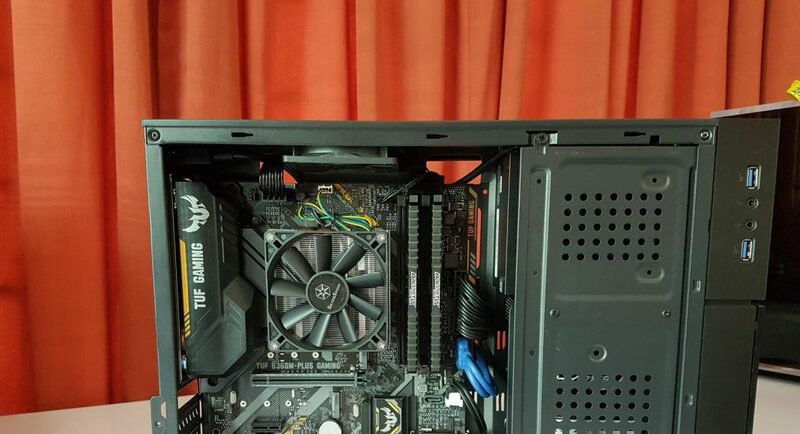 Since this is not a conventional tower design, there was no point taking the front panel off as there is no fan mounting provision on the front side and as the PSU and storage drives are directly facing the front panel, the resistance to the airflow is quite high. The testing was done with all the panels on. CPU was stressed at 4.5GHz and cooler’s fan was set to run at its full speed. The average of all the cores’ temperature is taken and recorded as it is. For reference, I have included the ambient temperature reading as well. All the reported temperatures are in °C. During the stress test, the CPU did 82.67°C. I did not use the sound meter to take the acoustic readings due to un-controlled environmental noises. 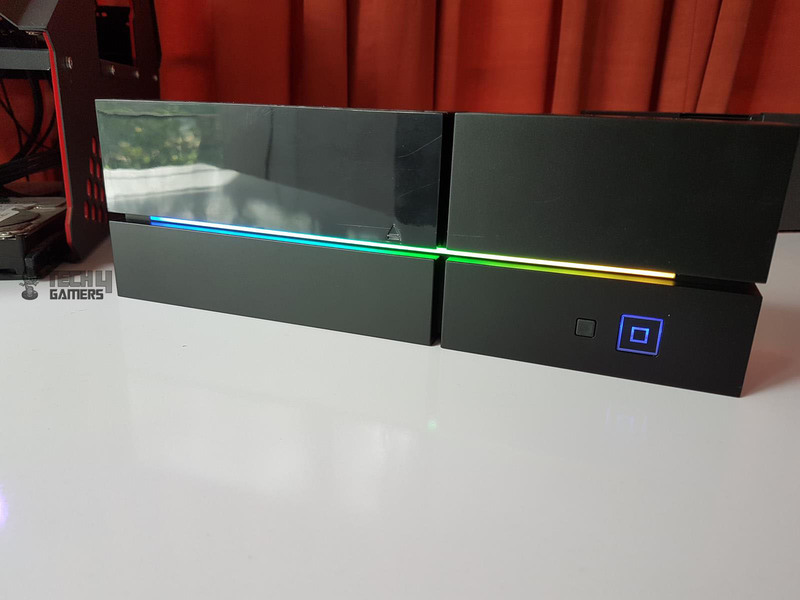 But based on my experience with fans testing, the overall sound experience was near silent. This is with the custom fan curve for the CPU cooler’s fan and top fan at full speed. 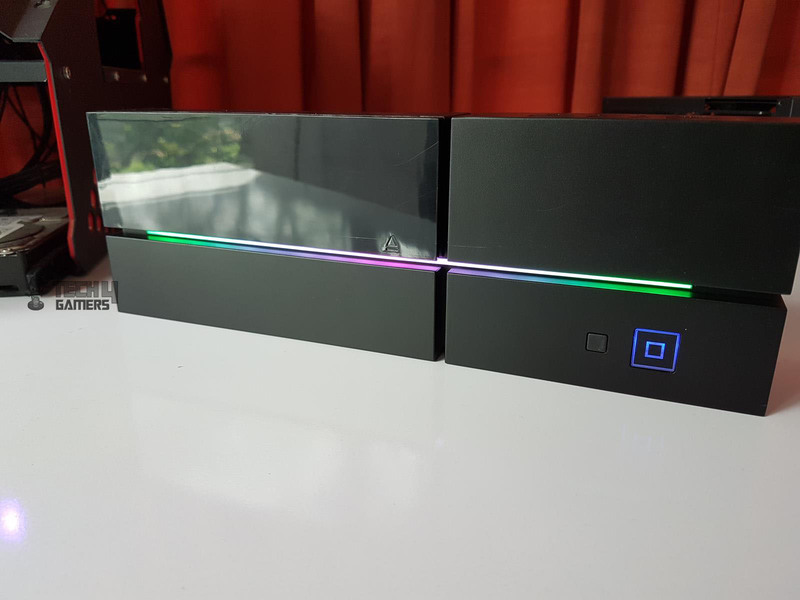 The Aerocool Play Slim is based on their CS101 chassis with a re-defined layout and RGB lighting. 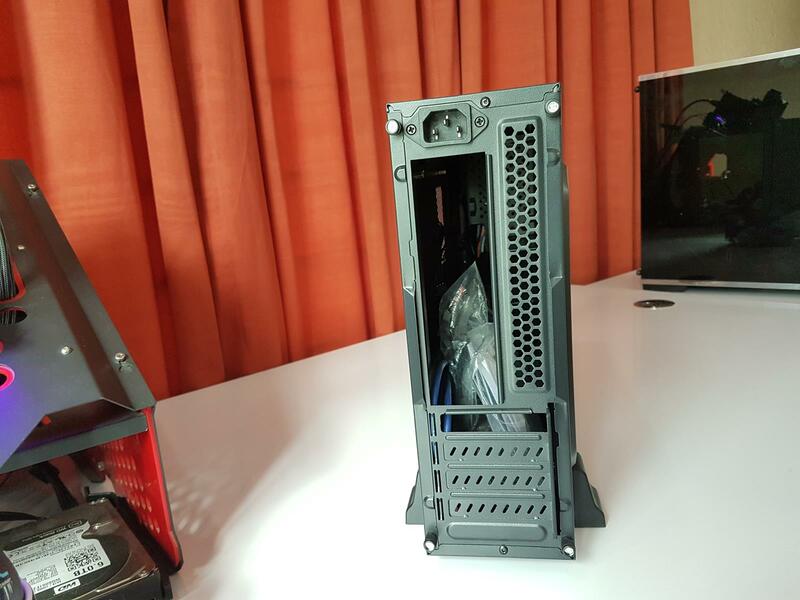 This is a slim/compact tower case that can be used as a tower or as a desktop. The chassis is made of steel and plastic with the thickness of the steel at > 0.5mm. The dimension of the chassis is 112x300x420mm (WxHxD). The internal dimension is 100x300x380mm (WxHxD). This chassis has a provision for 4 low profile PCIe slots. The maximum length of the graphics card without ODD is 240mm. 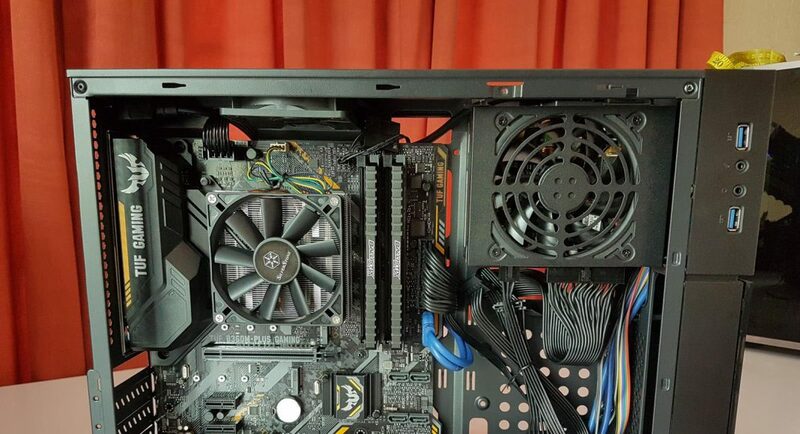 The maximum height for the CPU cooler is 80mm. 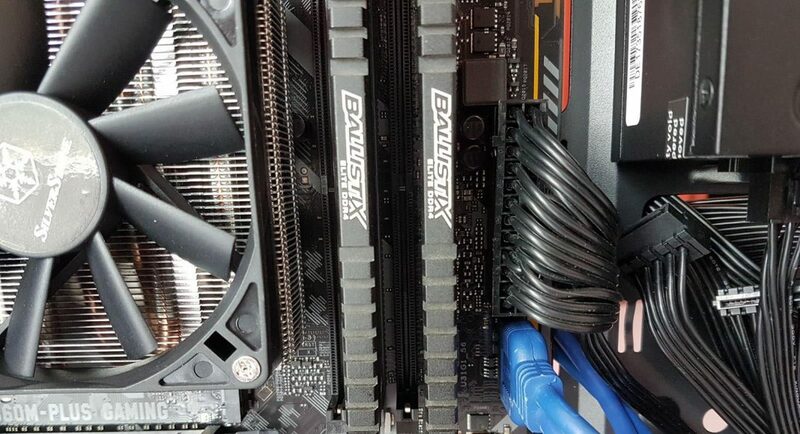 Only SFX PSUs can be used in this chassis. 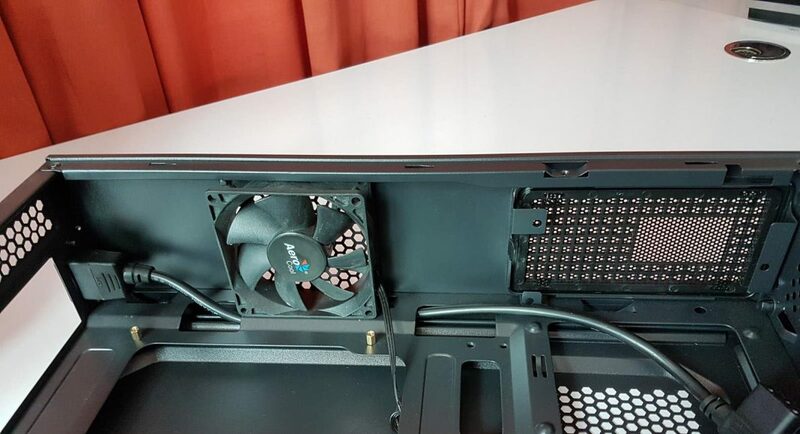 Up to two 80mm fans can be installed in this chassis with one on the top and one at the bottom. This chassis can accommodate a 5.25” drive, a 2.5” SSD, and a 3.5” HDD. 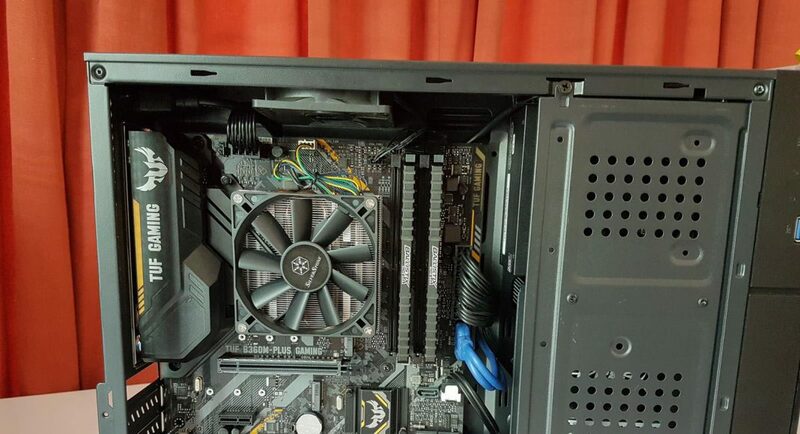 One fan comes pre-installed on the top. 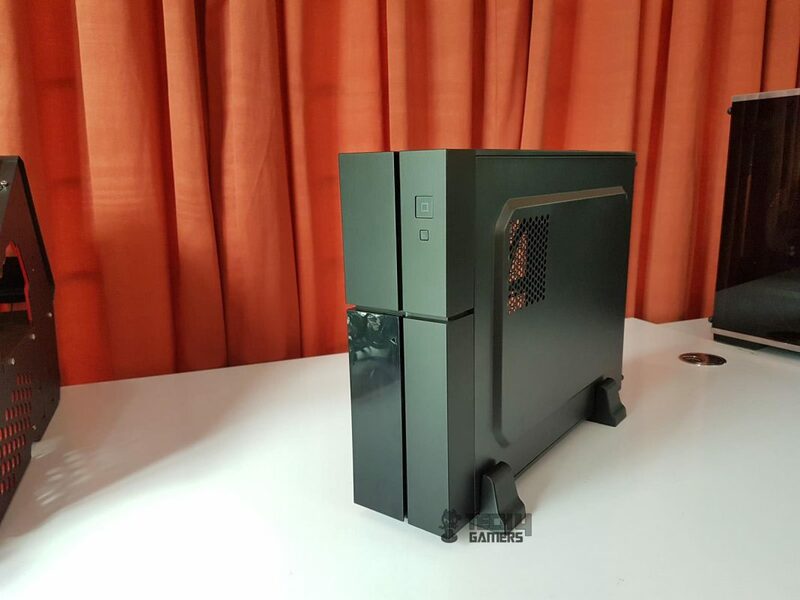 This chassis supports motherboard of sizes microATX and mini-ITX. 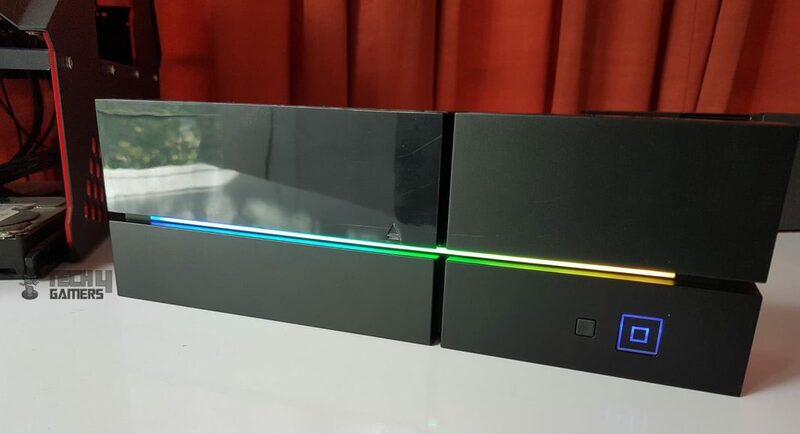 There is a cross design on the front panel which resembles that of the Play Station from Sony. 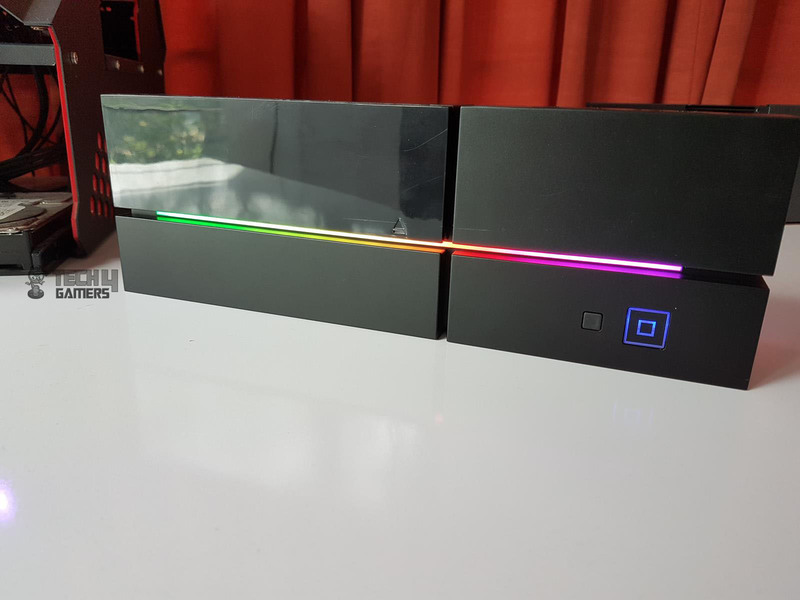 The RGB Flow lighting is provided on the front panel to compliments its look and feel and they do look good in person. 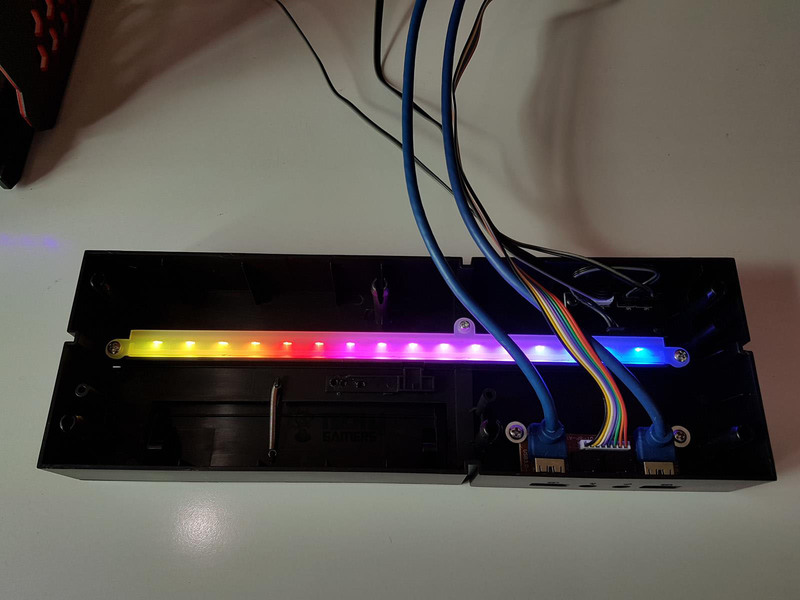 The LED strip has 16 addressable RGB LEDs on it being powered by a SATA cable. 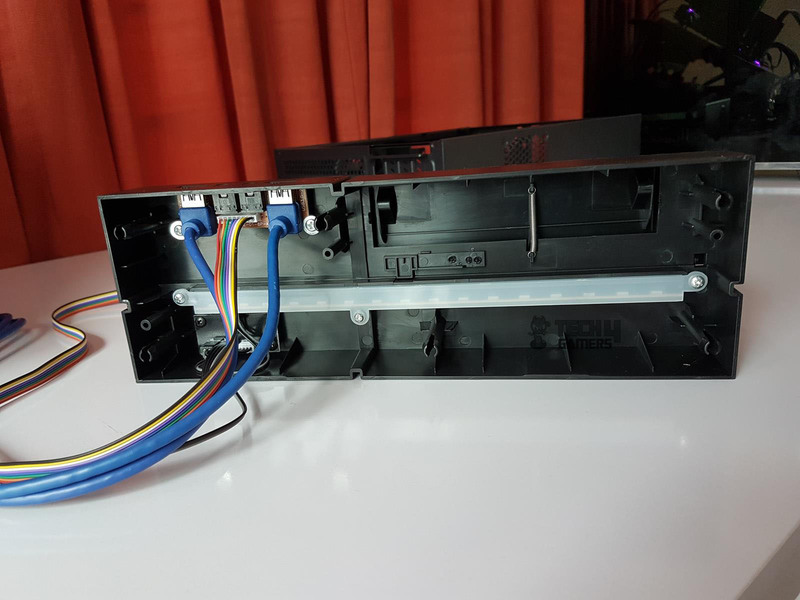 To make the clean looks on the front panel, the I/O ports are implemented on the left side of it (if the chassis is being used in tower format). On the front, there is only a power button which illuminates in static blue color and a smaller button to switch the lighting modes. Pressing and holding it for 2 seconds will turn off the lights. The chassis can be placed vertically or horizontally. 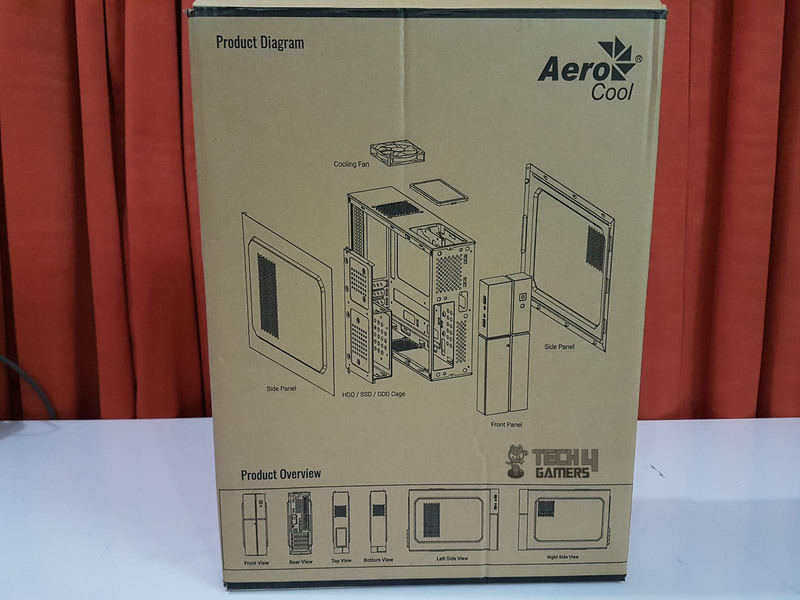 For horizontal placing, Aerocool has provided 4 rubber feet which can be pasted on the backside. 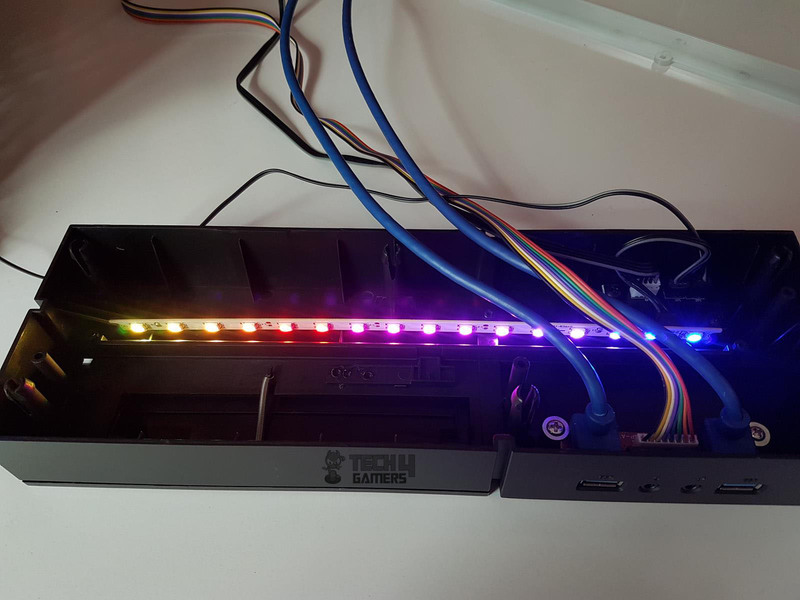 The chassis has two USB 3.0 ports and audio jacks on the I/O panel. 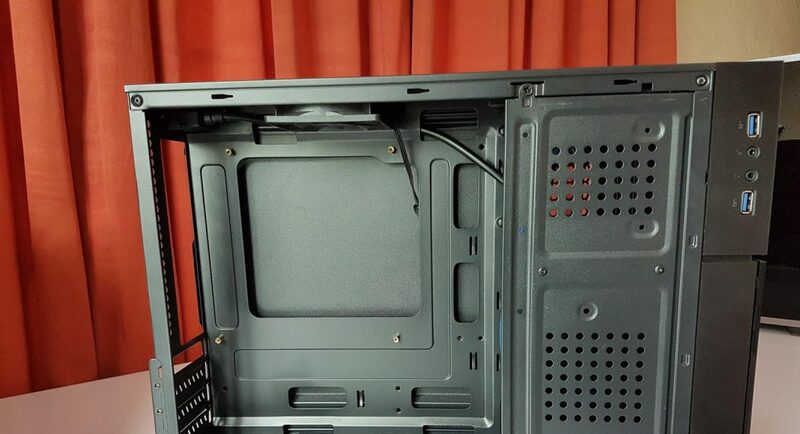 The chassis has a drive rack with unique implementation as it not only serves the purpose of hiding the bulk of cables but acting as storage drives cover as well. 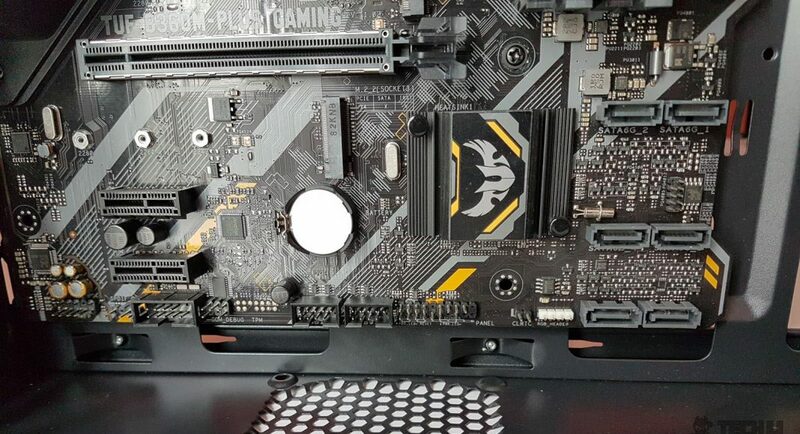 It is installed on the face of the left side in such that only the motherboard tray is visible to the viewer. 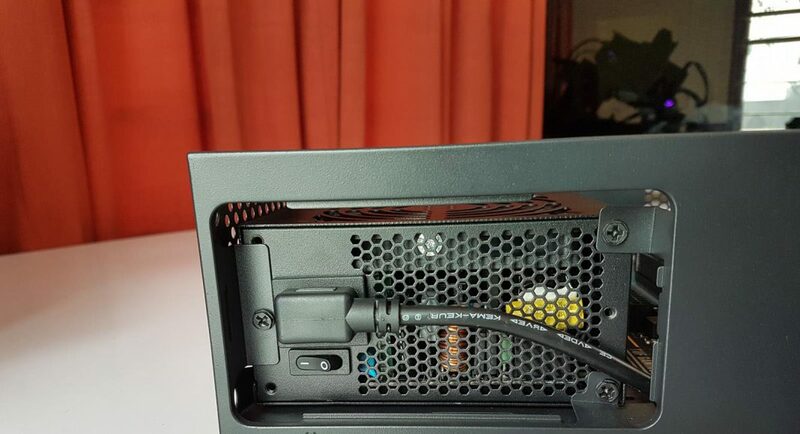 The power connector on the rear is like an extension cord that is running to the point the PSU mount. 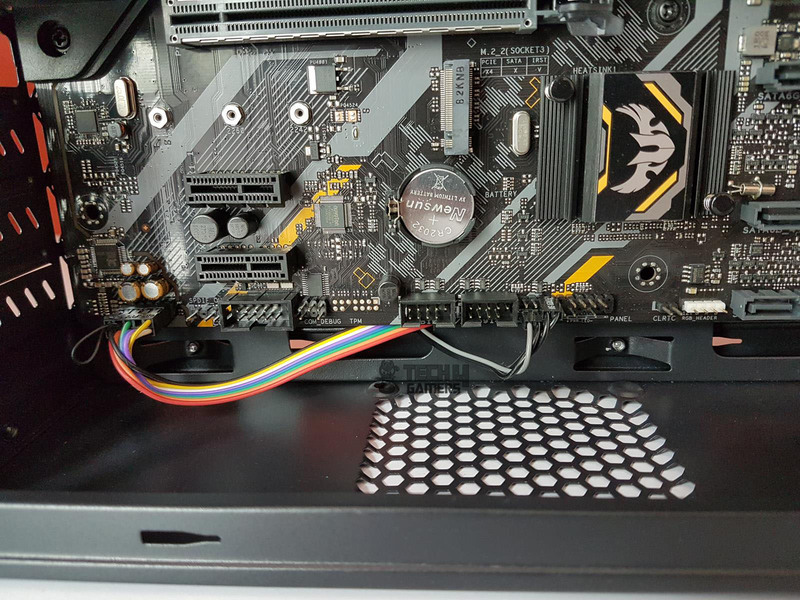 The PSU can be installed on the right side of the motherboard tray. There is no power on/off functionality at user’s disposal. 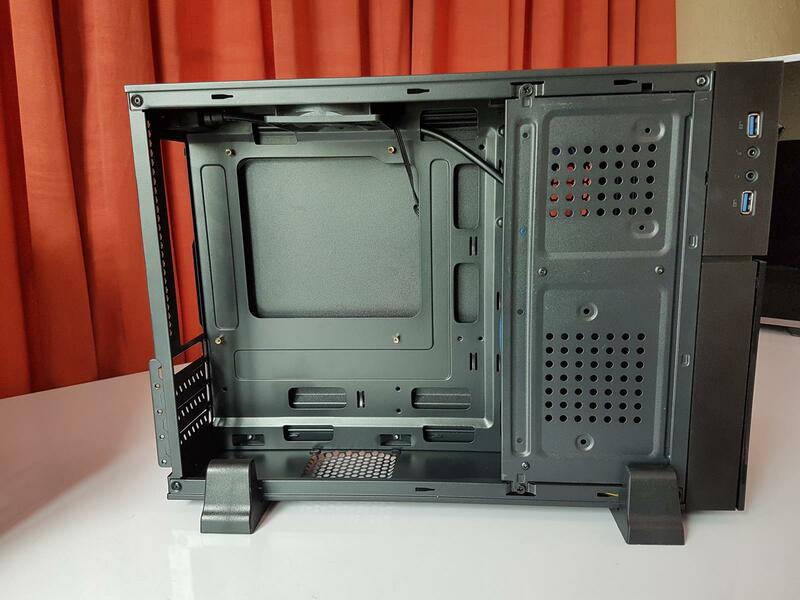 As the PSU mount has a top cover on the chassis which is only accessible from inside. So, make sure to power on the PSU after its installation. The plug of the power cord has a 90° slim design so that the top cover can be placed without any obstruction. The USB 3.0 cables and HD Audio cables are colored. Black color cables would have been nice for the clean look of the build. 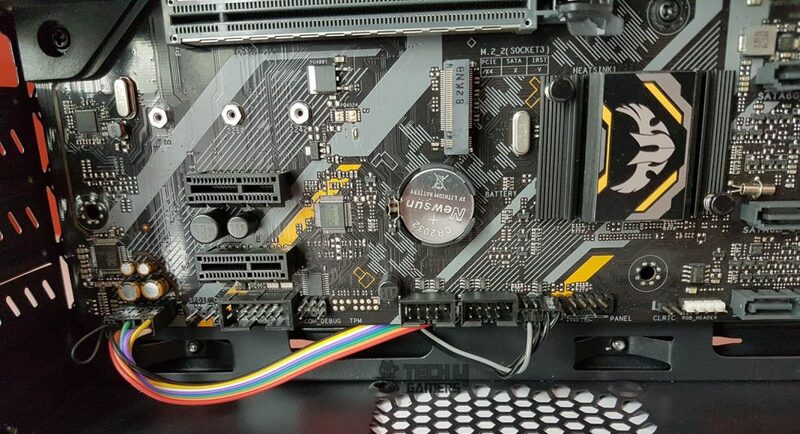 80mm fan could not be installed at the bottom as it was touching the pins of the motherboard. 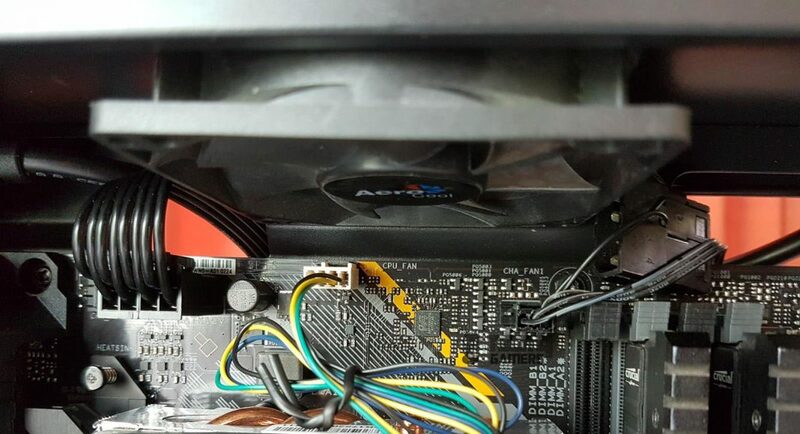 There was hardly 20mm or so spacing available for the fan’s height. This would not be an issue with the mini-ITX motherboard. There is approximately 78mm of height limitation for the graphics card. 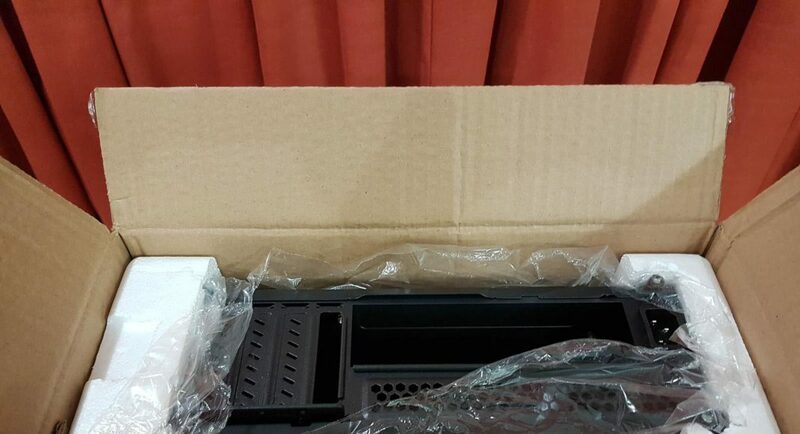 The pre-installed PCIe slot covers are not reusable. 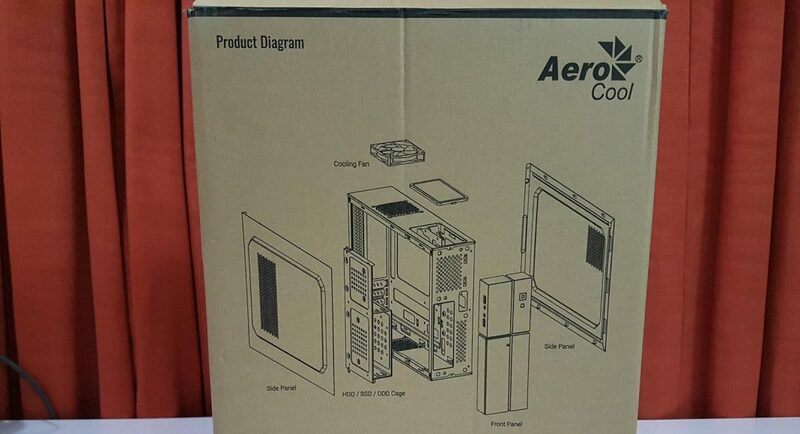 However, Aerocool has provided a reusable PCIe slot cover in the accessories. 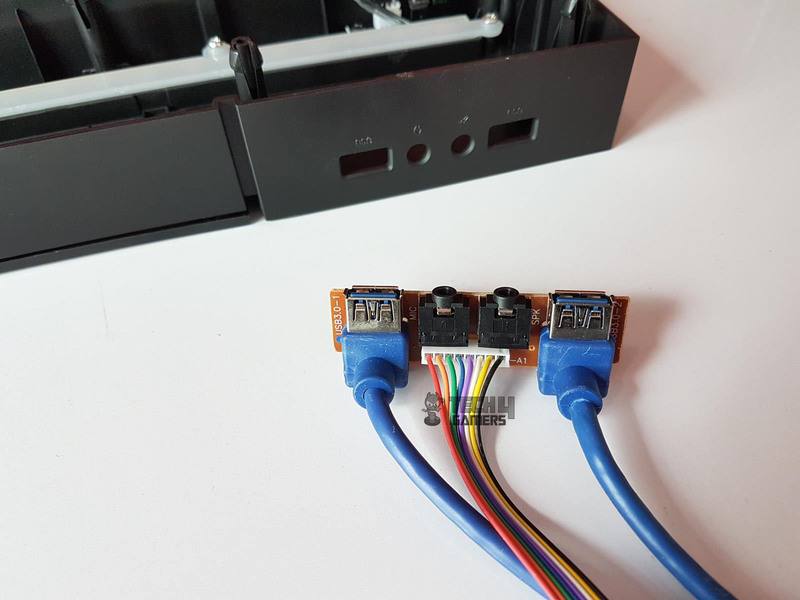 The pre-installed 80mm fan has 3-pin connector as well a 4-pin Molex connector. The length of the Molex portion is hardly 40mm which should have been more so that it can hide behind the motherboard tray when not in use. 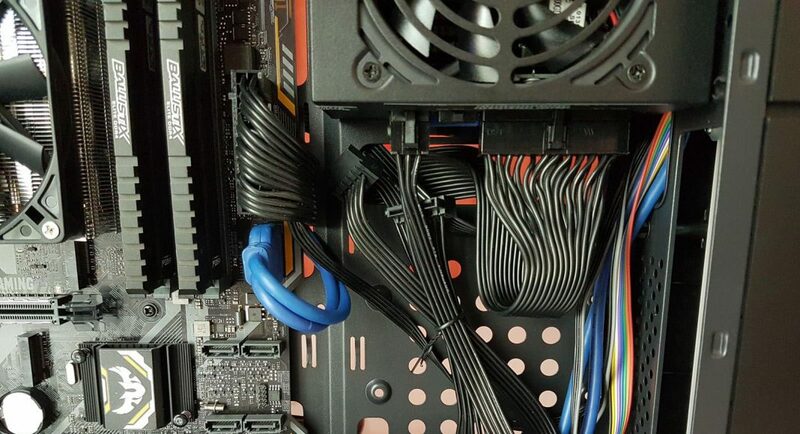 A fully modular PSU with flat cables is like a blessing to use in this chassis otherwise cable management is quite challenging. 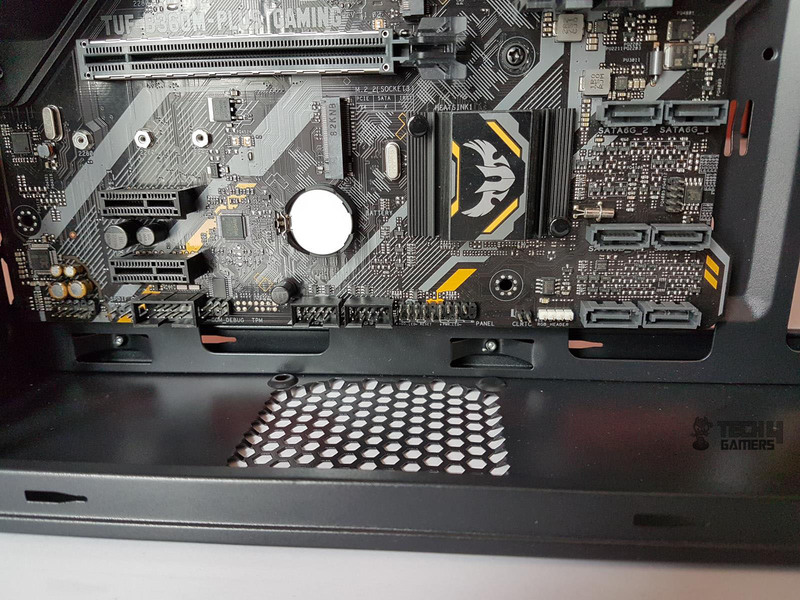 There is no as such spacing behind the motherboard tray except that of 7-8mm coming from indentation on the side panel. My overall assembling experience in this chassis was satisfactory. 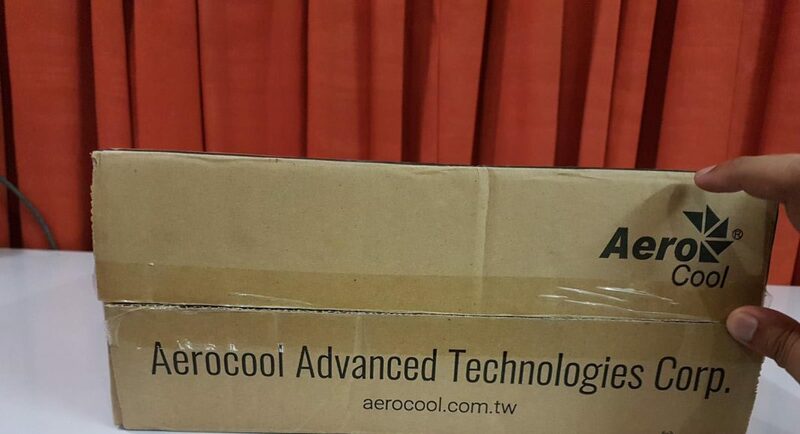 The Aerocool Playa Slim is listed at $39.90 MSRP. 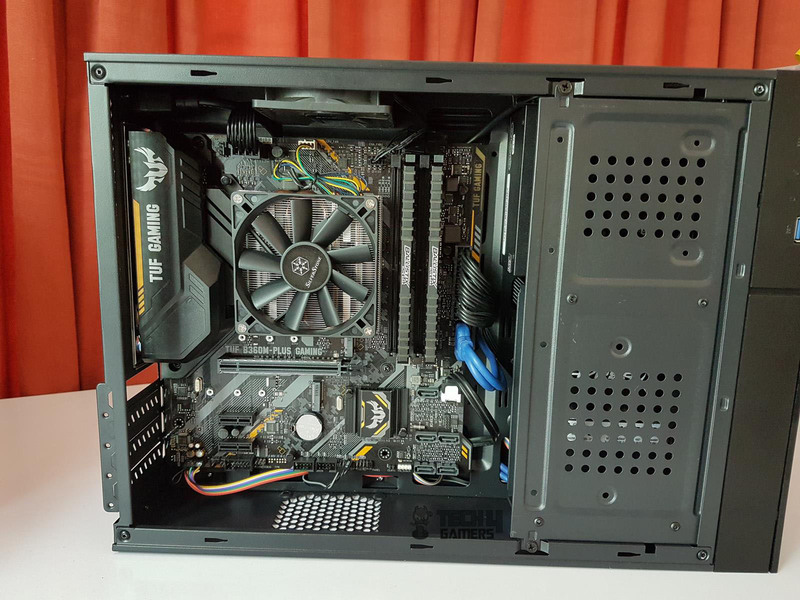 This chassis is aimed for budget users who are space constrained but still want to PC gaming experience. This price bracket makes it’s a good value for such users given the fact that it is RGB enabled as well. 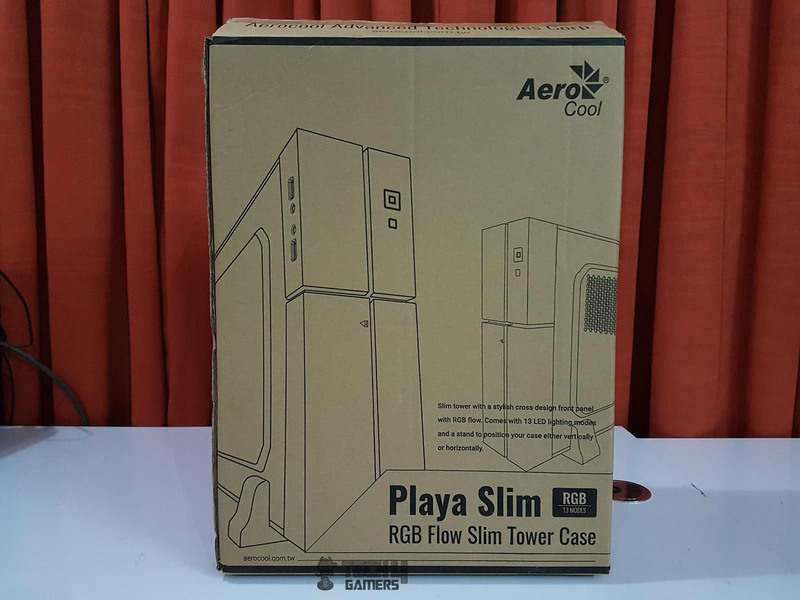 We are thankful to the Aerocool for giving us the opportunity to review their Playa Slim RGB Flow Gaming Chassis. 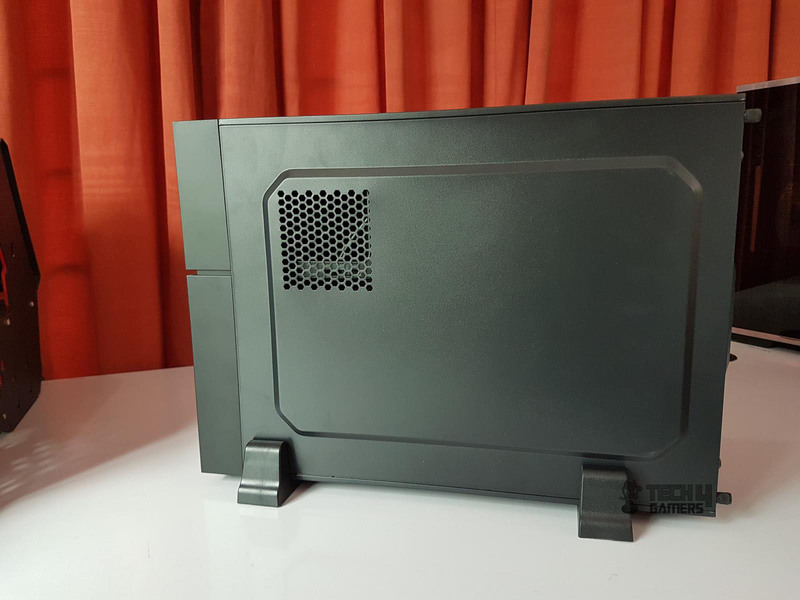 The Aerocool Playa Slim is a viable option for the budget users who are space constrained and want to experience PC gaming. 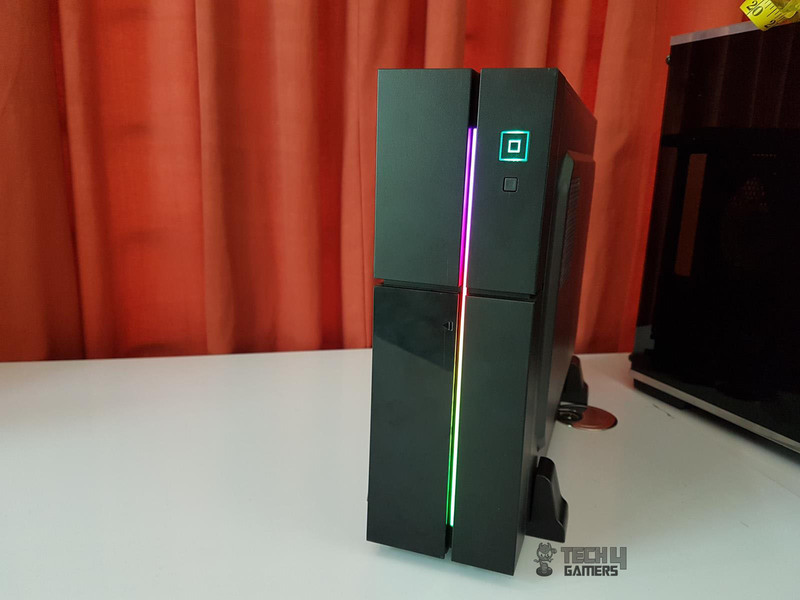 The beautifully crafted front panel with stunning RGB lighting makes it more appealing. All of this at only $39.99 is a good deal.